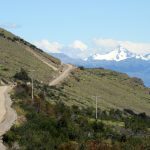 The Carretera Austral was a real challenge, but the famous Road 40, leading the Terra del Fuego in Argentina, might just well be even more difficult as it’s very isolated, but also, because some of the road portions are hit by strong winds and in very bad condition. As if what was waiting for me was not enough, I decided to thru a remote road. 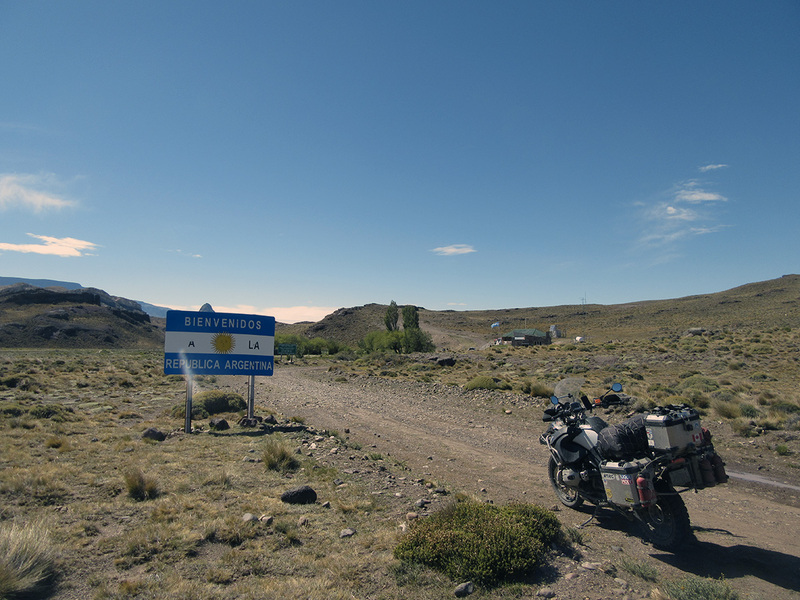 Most people head towards Chile Chico, but I decided, after judicious advice from Daniel (motopatagonia.com, from Pucon), to venture towards Paso Rodolfo Roballos, an alternate border crossing between Chile and Argentina. I left my superb 5-star hotel (no comments!!!) at about 9h30, which is a bit late. Since I left Santiago, I have a tendency to eat get to sleep quite late and it is a bit difficult for me to wake in the morning! The sun sets late here, therefore it is less problematic if I need to drive past dinner time. The morning is cool and I must slip on my heating jacket. What happiness to have this piece of equipment with me. I must drive back 20 kilometres northward to get to the intersection heading east. 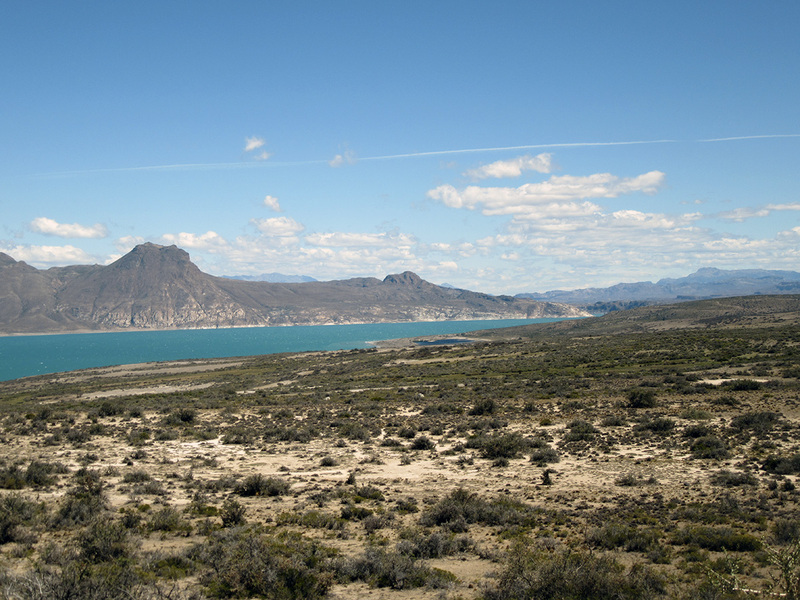 Rapidly, the landscape is completely transformed, passing from green mountains to a more deserted scene. I make new friends, but they are not very social. 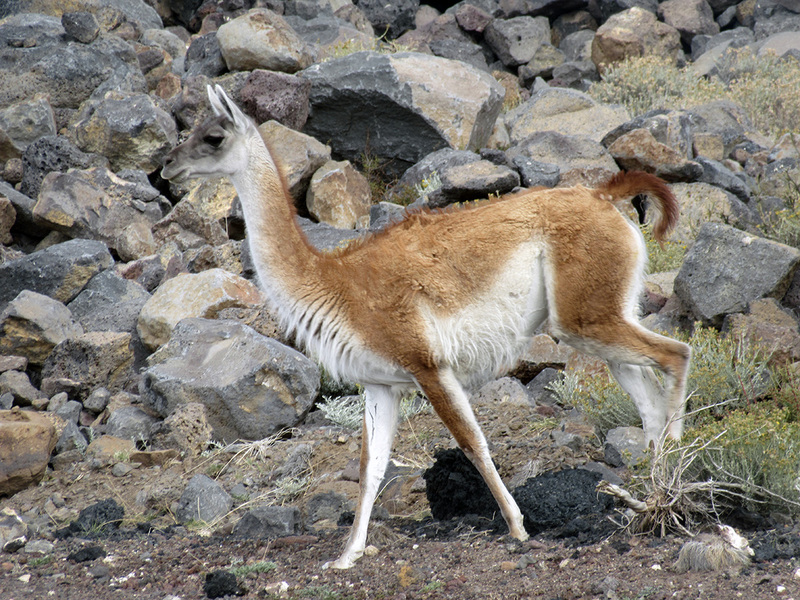 They are very shy and run away quite fast! 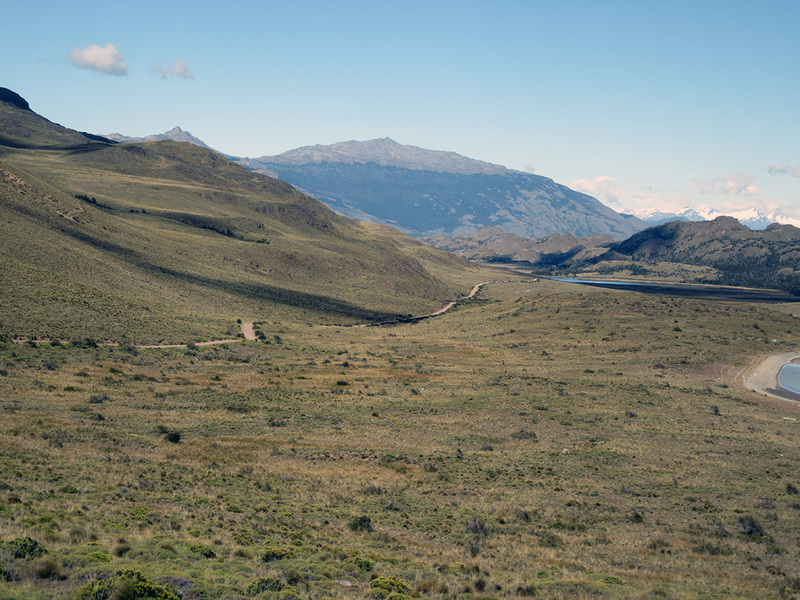 The road stretches for several dozen kilometres. 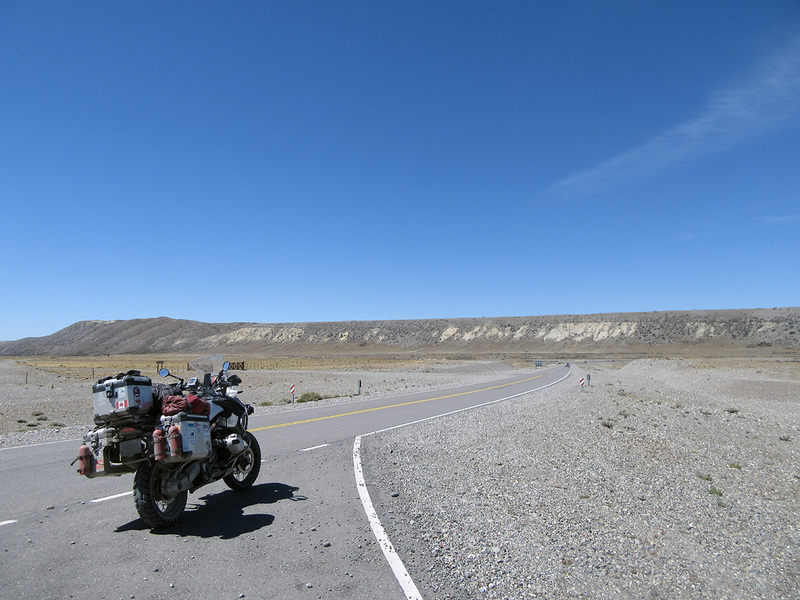 I crossed only a coupe of cars and I also met 2 Canadians on motorbikes. They are from British Columbia. I come back to it a little later. 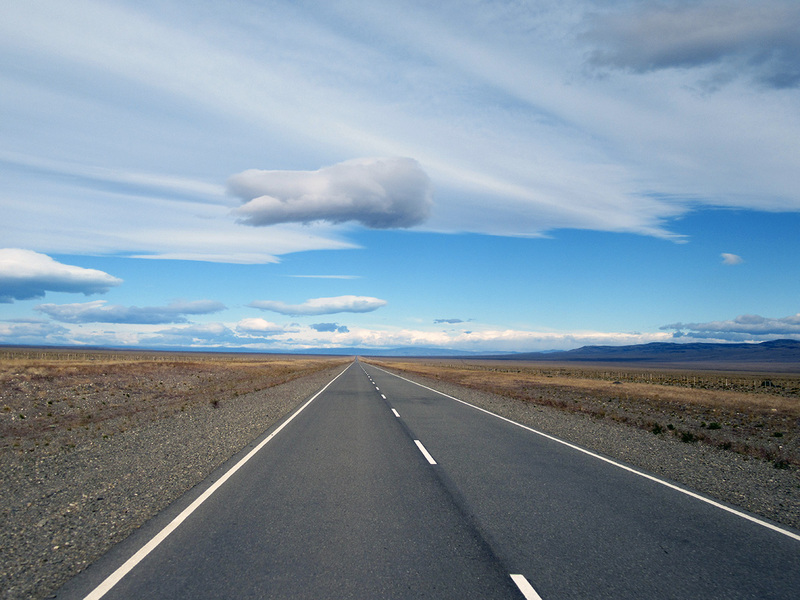 The road seems to stretch out infinitely. 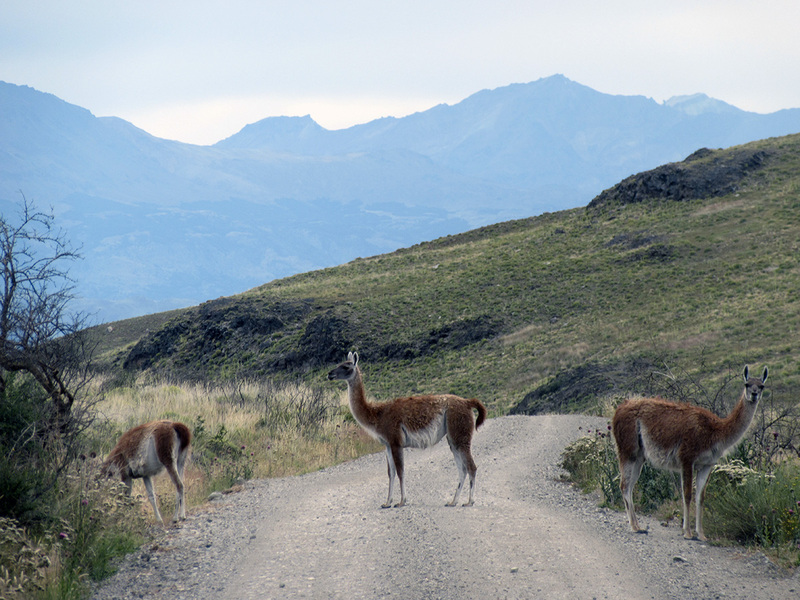 It reminds of me of when I was lost on remote roads in Peru. 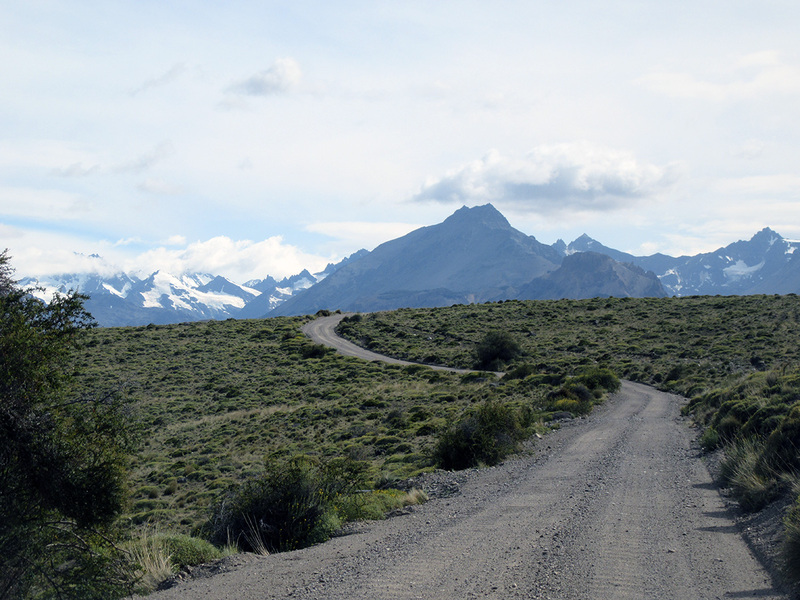 The difference here, what helped me a lot to be more serene and to appreciate the landscape, is that I know that it is an official road and where it leads! 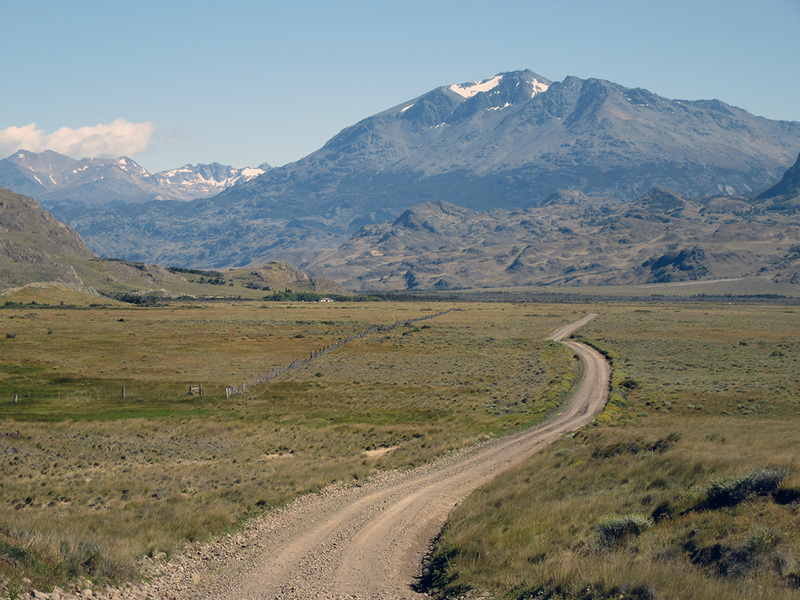 This long gravel road section was one of the nicest moments of my trip. 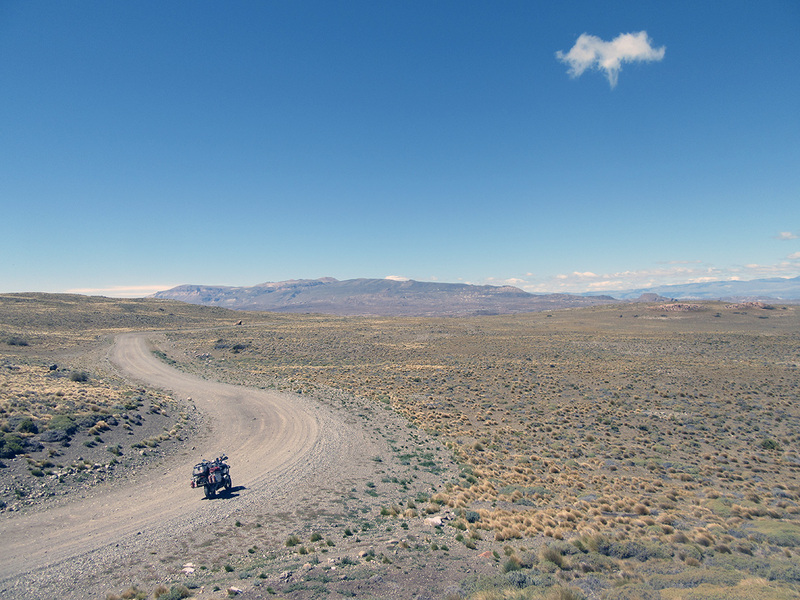 Perfect weather, isolation, good gravel road, animals, all of these ingredients together is the perfect recipe for a feeling of pure happiness! 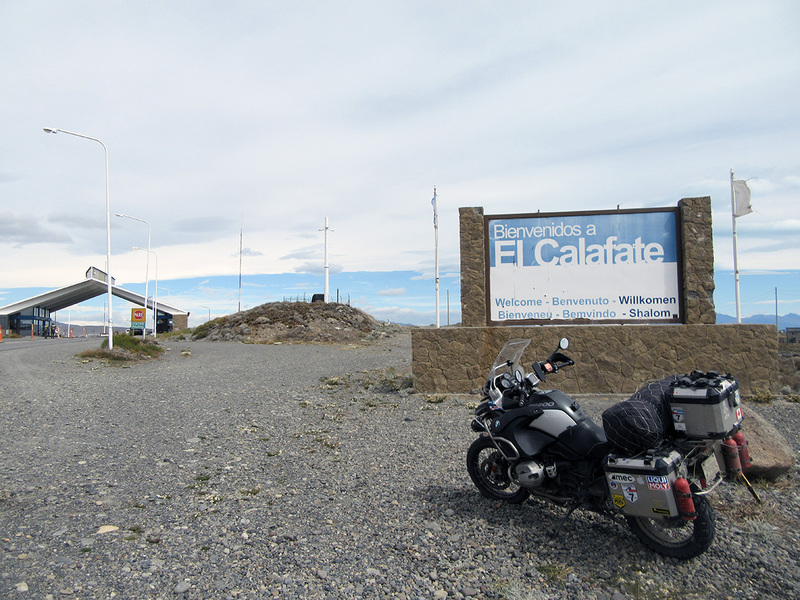 After a few hours of driving, I arrive at the Chilean customs post. Procedure takes 5 minutes and 2 agents are nice extremists. Why it isn’t always so simple to pass borders? The place is quite isolated, but I am apparently not the first adventurer to come thru here! 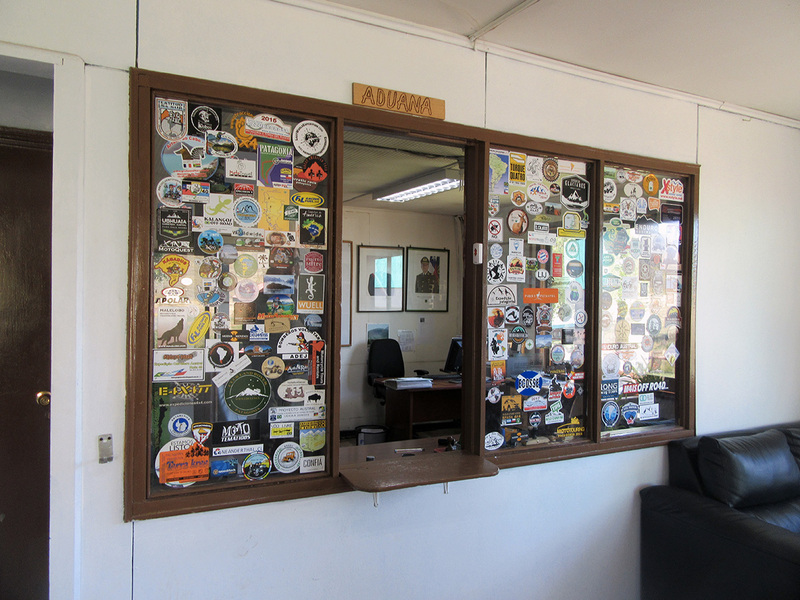 It is nevertheless touching, because I must admit that some of the stickers from people I followed on the web during several months while preparing the trip. 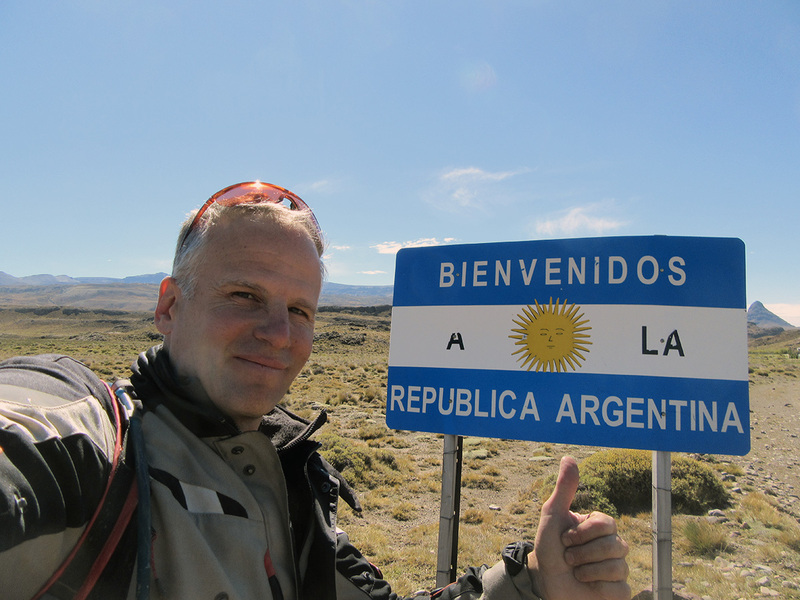 Now, it is me who is here, in 24000 km from Montreal, lost at the border between Chile and Argentina, in Patagonia!!! 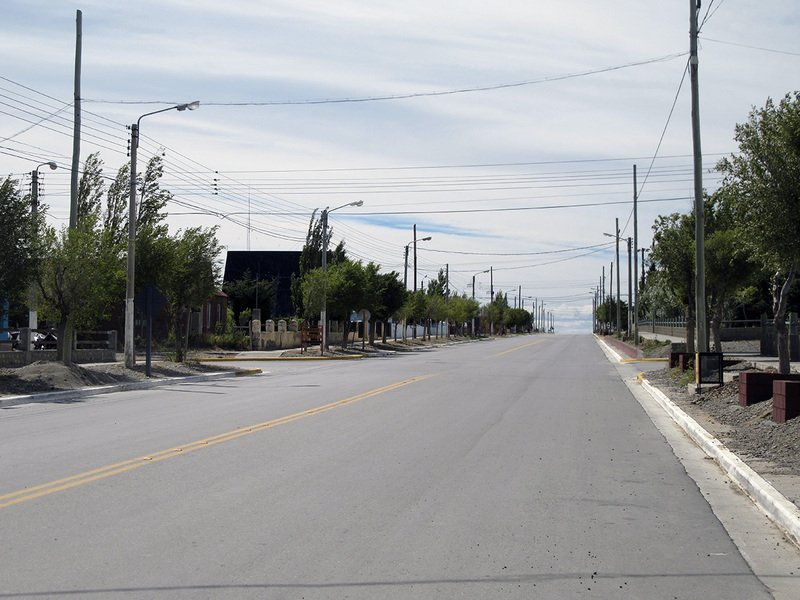 Afterwards, I head towards the office of the Argentinian carabineros, located 15 km east. Passage is also very simple. I import my motorbike as well as myself in 5 minutes. Insurance proof was not asked for. My bike is permitted to stay in the country 6 months. 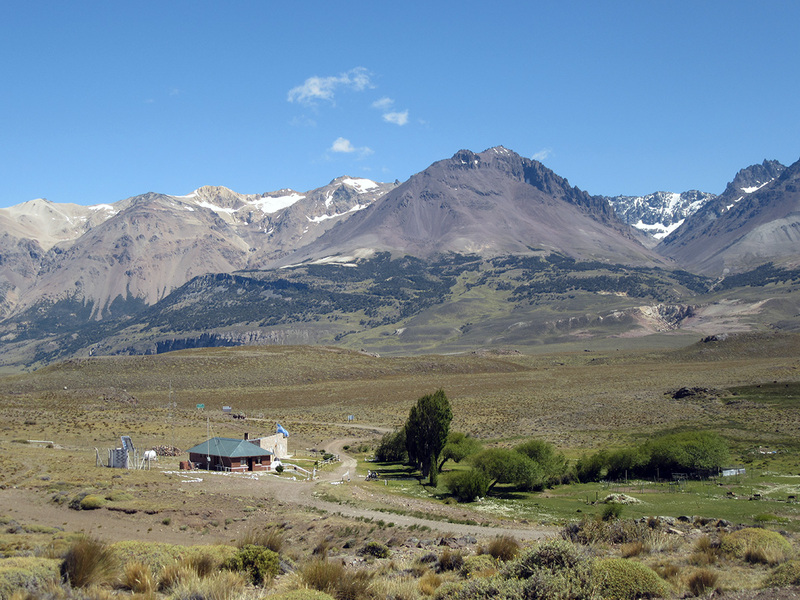 As for me, I have a 3-month tourist visa, but it is not so important as I am going to go back to Chile in a few days. I am not a big fan of selfies, but I could not resist here. My big face spoils the photo quite a bit, you understand why I do not use this technique too often! 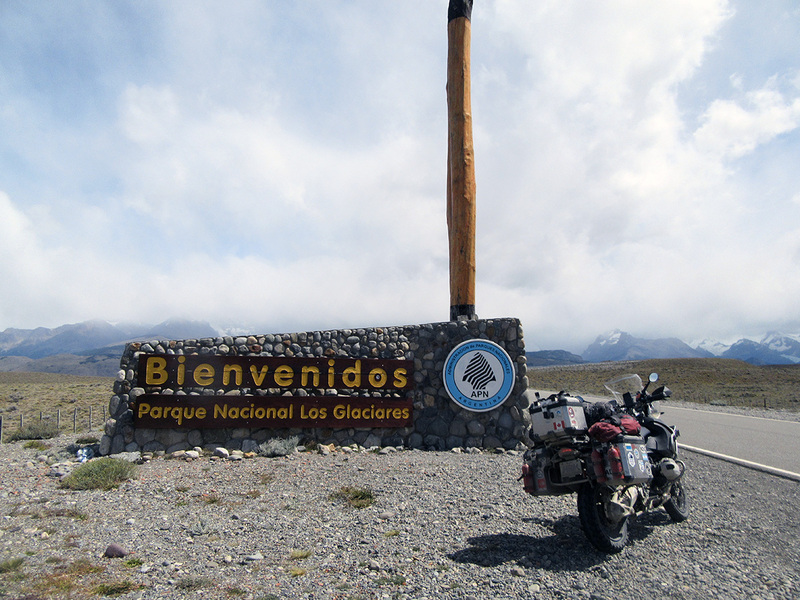 Entering Argentina, 3 things happen…. Some stretches are really dangerous and it is essential to be completely concentrated on driving the bike. 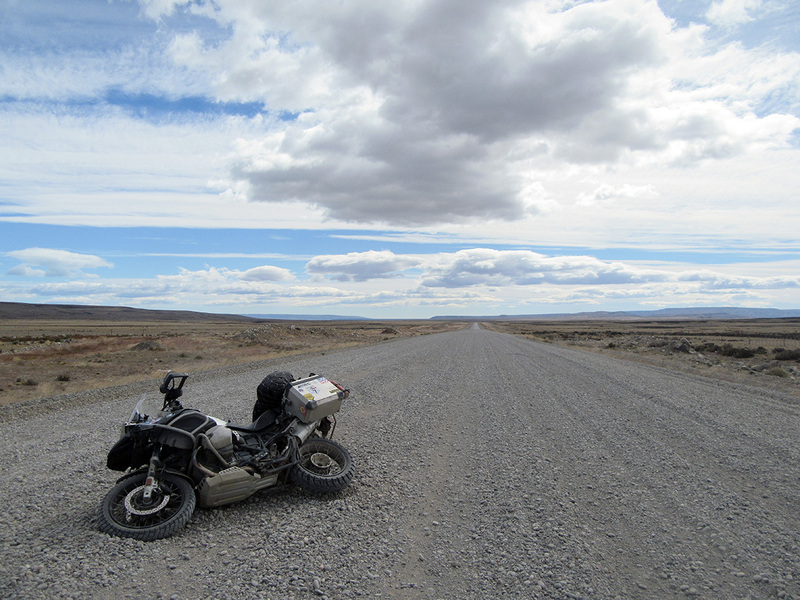 Gravel is not as what we have in North America. Stones are not crushed. Here, the road is composed of big round rocks. On 4 wheels, it is difficult, because it is easy to reck components under the car. 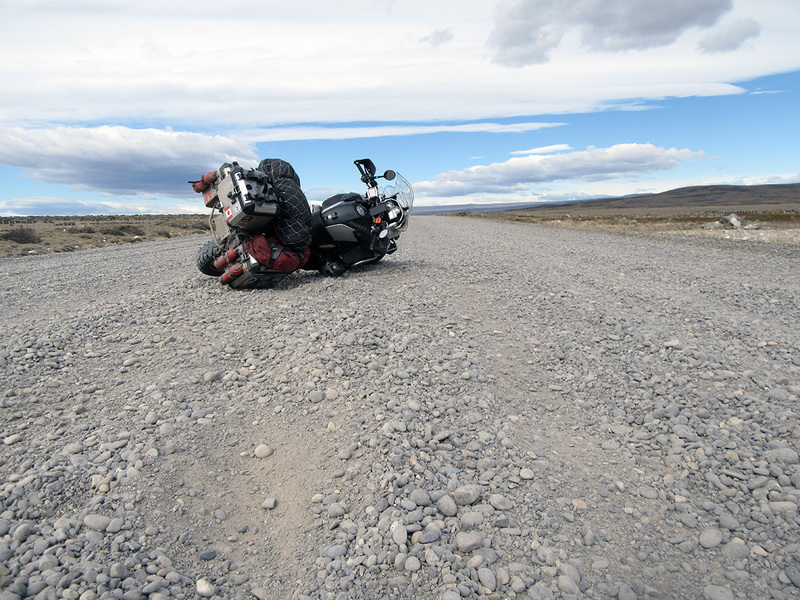 On a motorbike, it is like trying to walk on a surfboard or a floor made of balls. 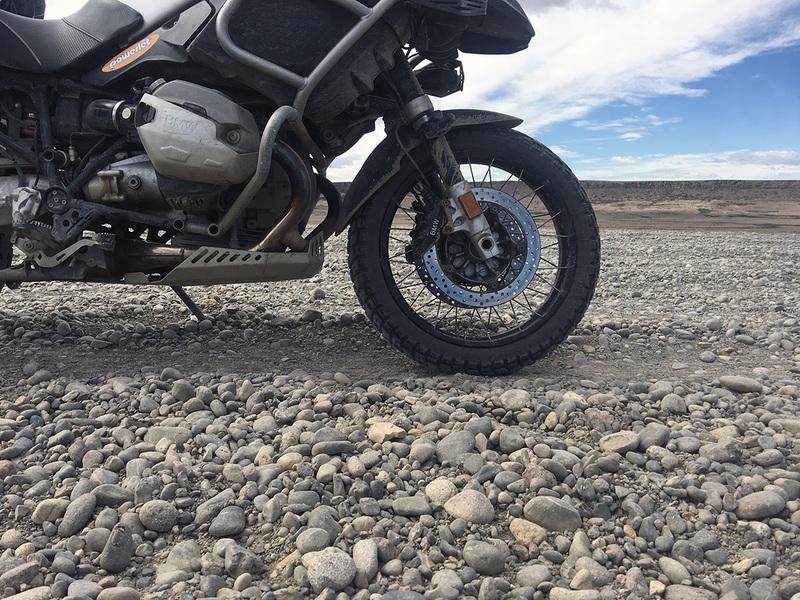 After a few days driving on gravel, this sight was a pure joy! 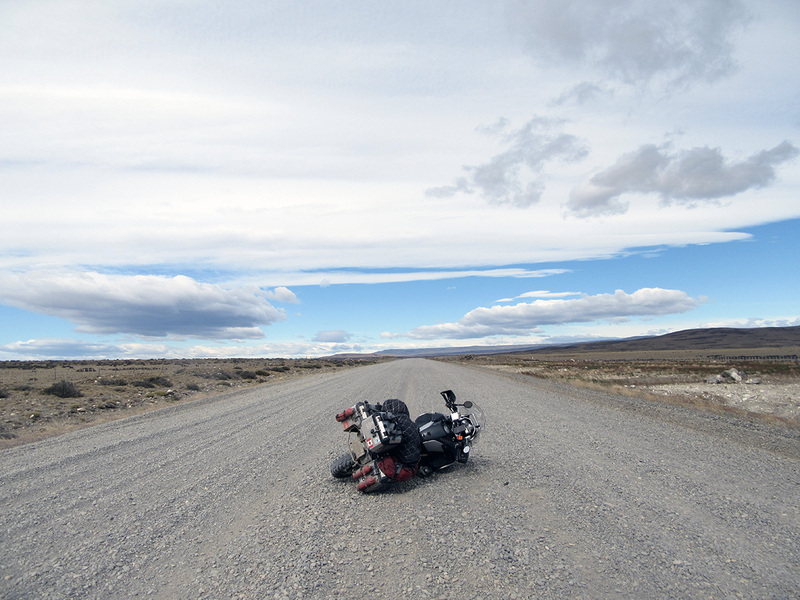 Even if winds are extremely strong, asphalt and motorcycles make a very pair! I even could, when the wind came from behind, drive as fast as 180 km/h without feeling anything, in silence, as though I was stopped! It is really special. 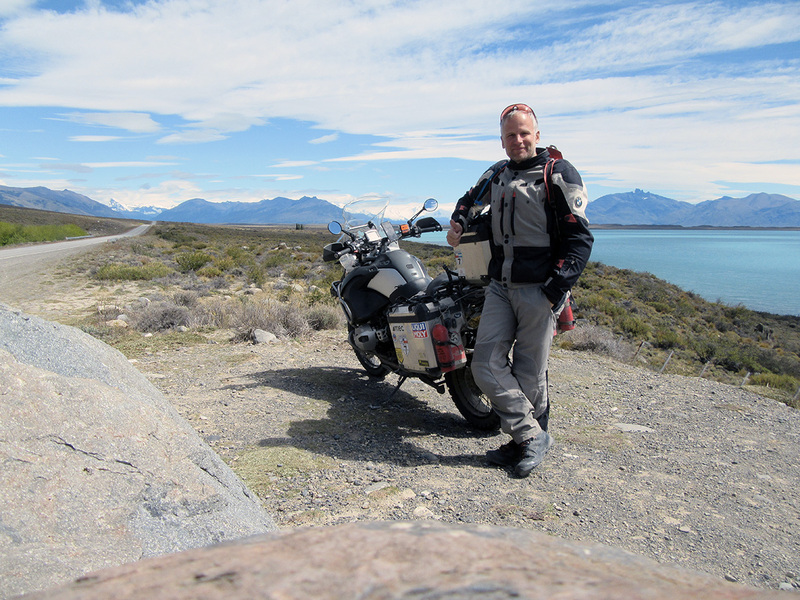 On the other hand, when I must fight frontal wind, I am happy to have a motorbike equipped with a good windscreen and a good protection for the legs. I raise my hat to people who pass thru this place with smaller bikes. It must be very exhausting to fight this dreadful force. Unfortunately, it is a bit difficult to take a photo of the wind! 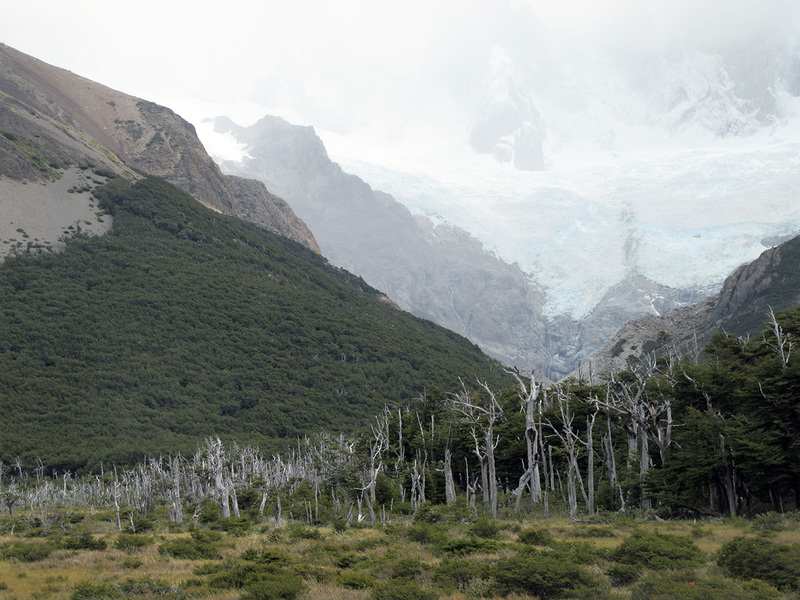 One of the problems in the Argentinian Patagonia is filling up. I am lucky to have a machine with a normal autonomy of more than 500 kilometres per tank. Some can only go through 200 or 250 kilometres, what is an issue here. 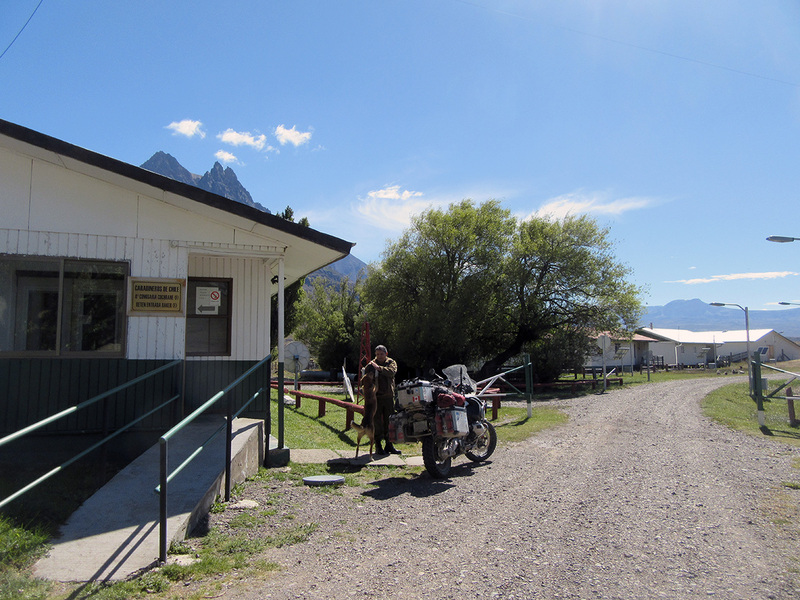 For example, I went drove 250 km between Cochrane and this petrol station, located in the tiny village of Bajo Caracoles. And guess what, the guys simply decided to close the pumps, because it was the birthday of one of their friends, and that they absolutely had to participate in the party! If I was the only place where people could fill up for hundreds of kilometres, I would plan a timetable to remain open and be able to serve people in need! 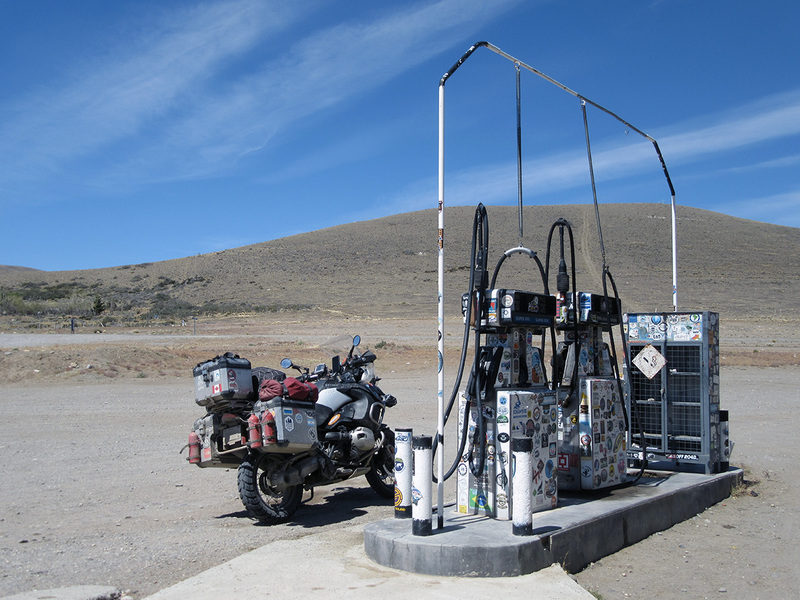 Lessons learned, always have a lot of patience or to plan enough petrol to have the luxury to be able to pass one of the stops. I chose the second option! 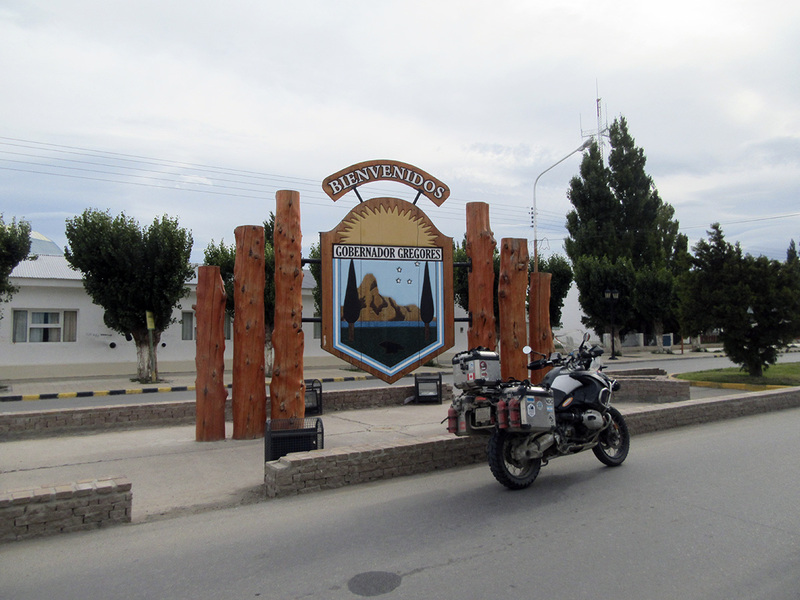 Everything is good, I had enough petrol to get to the next service station located in the superb (read: the opposite) village of Gobernador Gregores. It unfortunately was not the case for several other drivers who had been parked there for several hours. In this city, which is a compulsory stop more than a place that needs to be visited, I paid myself the luxury of the nicest hotel around. Fortunately, it was not too expensive (around 50$). It feels so good to sleep in a warm, quietly, modern and clean place with a bed which does not date from the previous century! The wind was blowing very hard in the village and I could not cook (impossible to light my stove). I therefore searched for a small restaurant, but I determined 2 things. Firstly, prices are mad, then, after having found a small that was not so bad, I noted that people smoked inside bars and restaurants. Yes, yes, in 2016! It was out of the question that I spent more than 30 seconds in this place which smelt an old ashtray. I ended up getting 4 empanadas in a corner bakery for a few dollars, opened a wine bottle, which I always carry with me for such emergencies, and used my luxurious and clean room to dine! This Gaucho spent the evening on his horse with his dog braving the wind and cold. A true combatant! 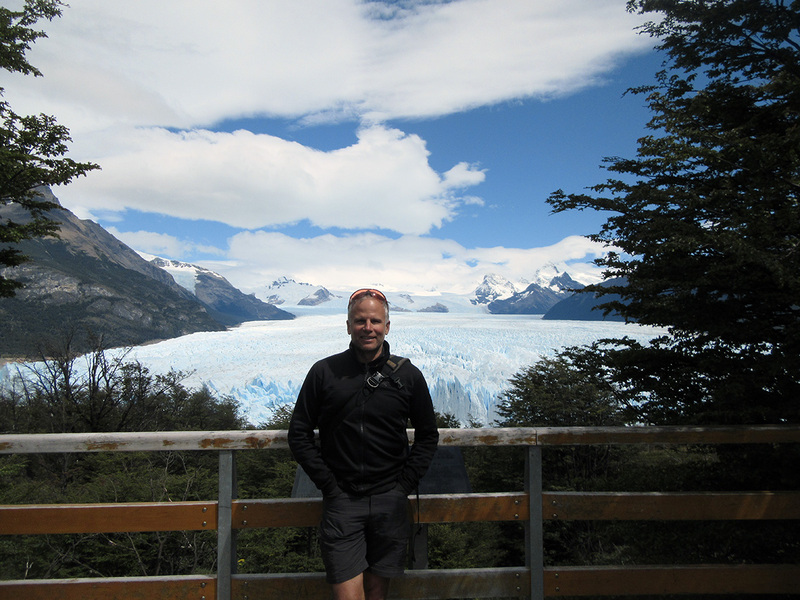 Or perhaps I had too many Quilmes (the local beer!)? The next day, a challenge was waiting for me. Indeed, a portion of the road 40 is not paved and has a nasty reputation! Big stones, holes, construction, but especially the wind, which makes it difficult to go thru it with a motorbike, and sometimes, impossible. 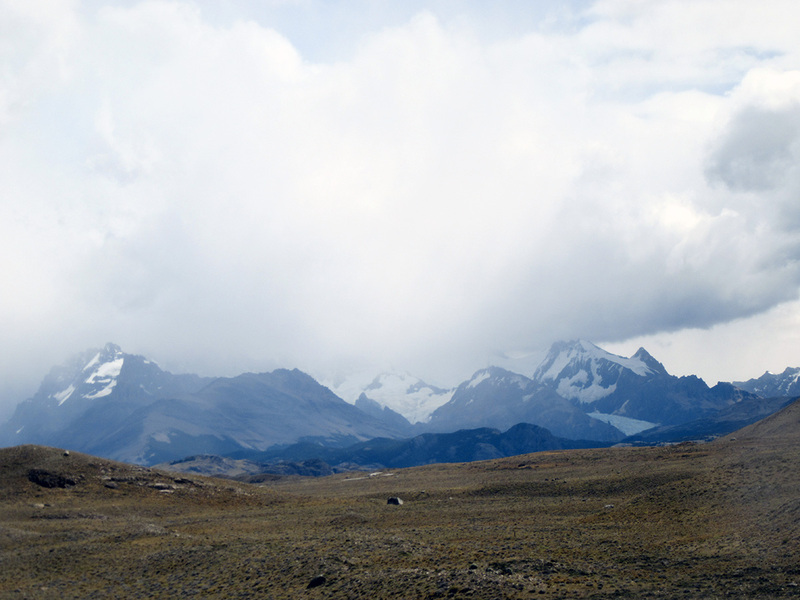 It is strongly recommended not to venture on it in case of rain, because some portions become very muddy. The first portion, about 70 km, is in perfect condition. The wind is however present, but I push it and go through the distance in a little more than 35 minutes (make your own calculations!). 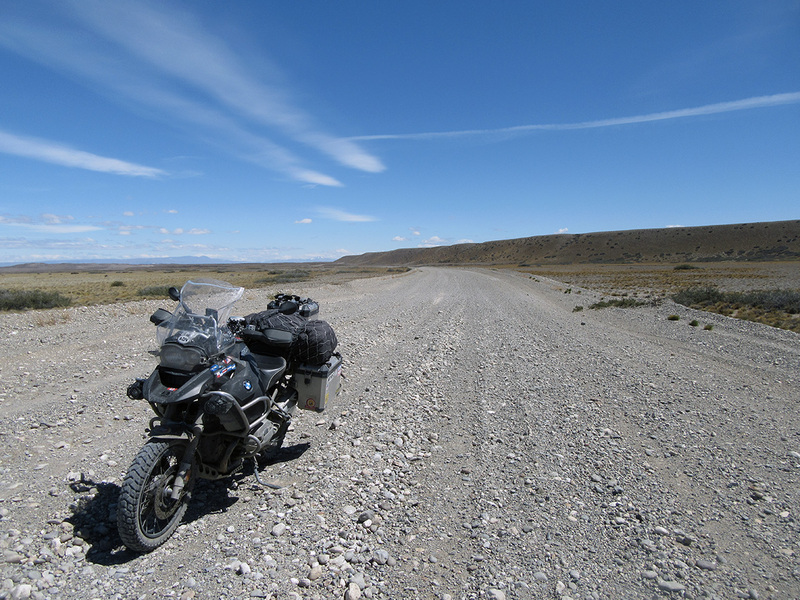 The only thing which makes driving here possible on a motorcycle is, for the pilot, to stay in the tracks made by 4 wheels vehicules. They are about 30 to 60 centimetres wide. I must concentrate all the time not to deviate from my trajectory. Even looking in my rear-view mirrors is difficult, it is essential to keep your eyes on the road so that the front wheel does not go towards one of the stony borders which are present on each side of the track. It is not possible for a person not riding a motorbike to understand the feeling being in this type of situation. I swear to you that it is even sometimes difficult to walk in this type of gravel as it is so deep, unstable and hollow. I am not a racing driver, I am not a professional motorcyclist, I have never driven motocross or enduros, but I have, nevertheless, a little bit of experience on the gravel behind the handlebar of a big GS. When the track, which I was following, simply disappeared and found myself in 30 centimetres of loose gravel, there was nothing to be done. I knew that I am going to fall. Problem, it is that I was driving at speeds between 60 and 70 km/h. The first thing to be made when the ground becomes softer (sand, gravel, mud) is to try to go faster! Indeed, transferring the weight of the motorbike towards the back allows to gain more speed and to augment the gyroscope effects produced by the wheels (my apologies if I’m not using the proper physics notions!) and to, as a reaction, augment the capacity of the motorbike to remain vertical, in spite of the opposite forces which are applied. That morning, there was simply too many forces which worked against me. 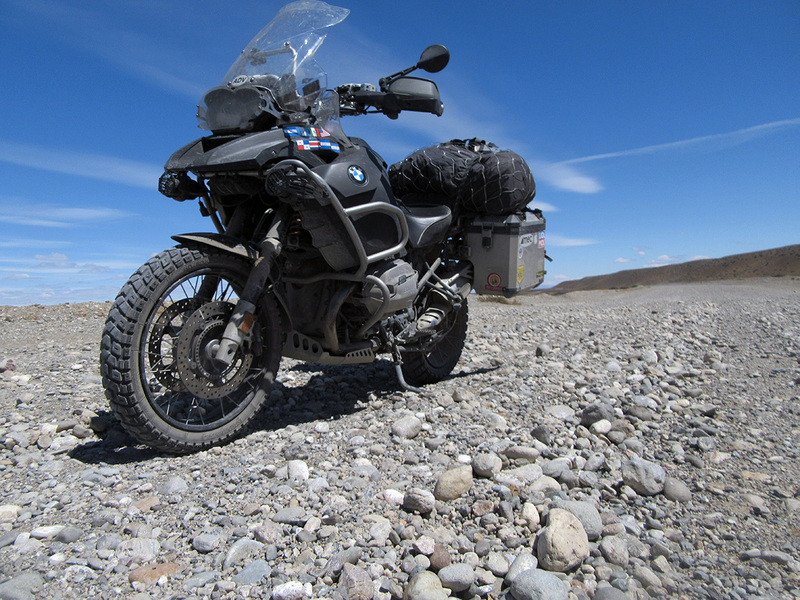 The gravel was too deep, too big and rounded stones and the wind was very violent. My choice was narrowed to how I was going to put to lie motorcycle to rest! I did try to move accelerate, but I rapidly realized that I was going to be on the ground soon enough. I then tried to decelerate as slowly as possible with the rear brake, but shock was violent. However, ironically, I laughing my head off, as though I knew that this is going to happen and that finally, it did. 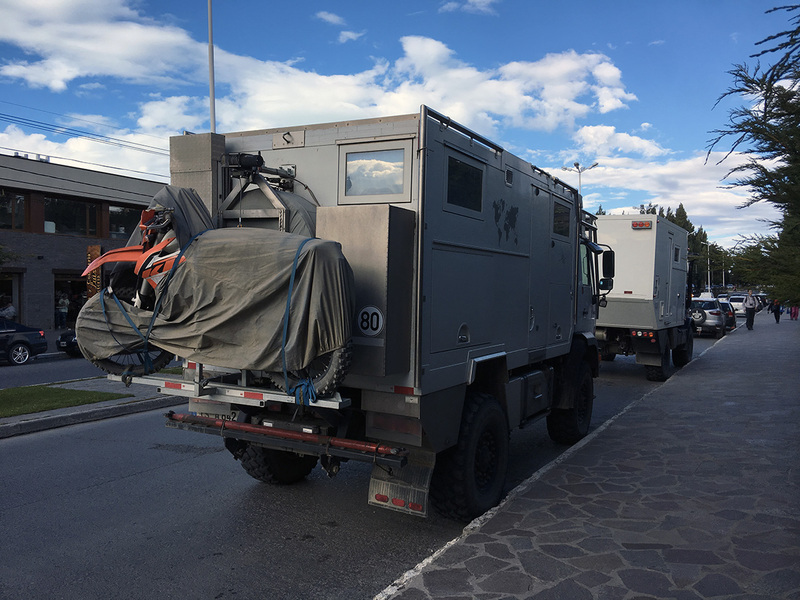 But also, as though now, it was a formality, or something insignificant to find the 250 kilograms beast in the horizontal position, having a small siesta (how would say my friend Peter P.!). It was my third fall in 24000 km. Not so bad! Just enough not to start making too much out of it anymore. Of course, this always remains a kind of failure to drop La Gorda for me, after all, my only responsibility towards her is to keep her vertical! But its scars will be a reminder of our superb adventure! I had to take my backpack off to be able to pick up the bike, and all this time, I was laughing! For many years my previous career, I have studied, or should I say, tried to understand, and I trained myself against the effects of vision tunnel during crisis situations. Here is a nice example of my failure! 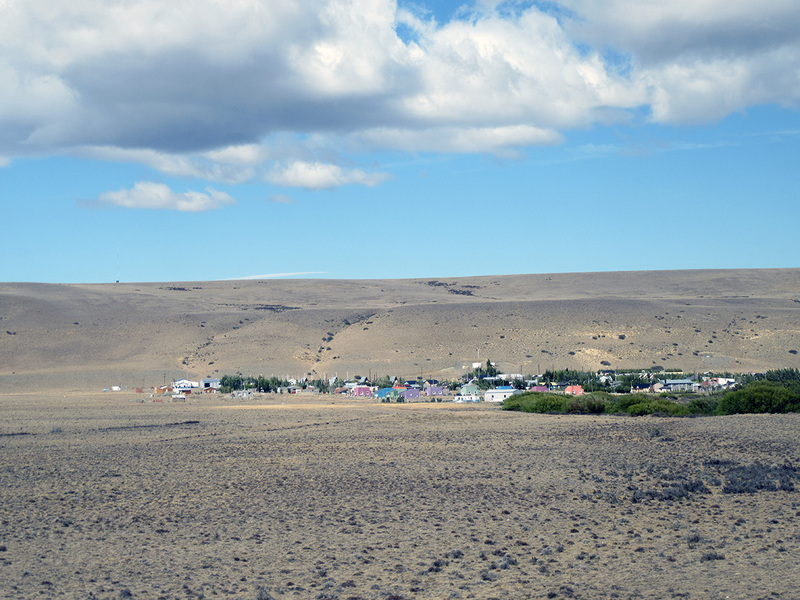 During all this time, I had not even seen that I had this friend who was looking at me from a short distance, probably having made the jump of all the noise produced by Gorda when embracing the gravel and thinking: “What is this Canadian doing here? Trying to disturb me during my lunch?”. 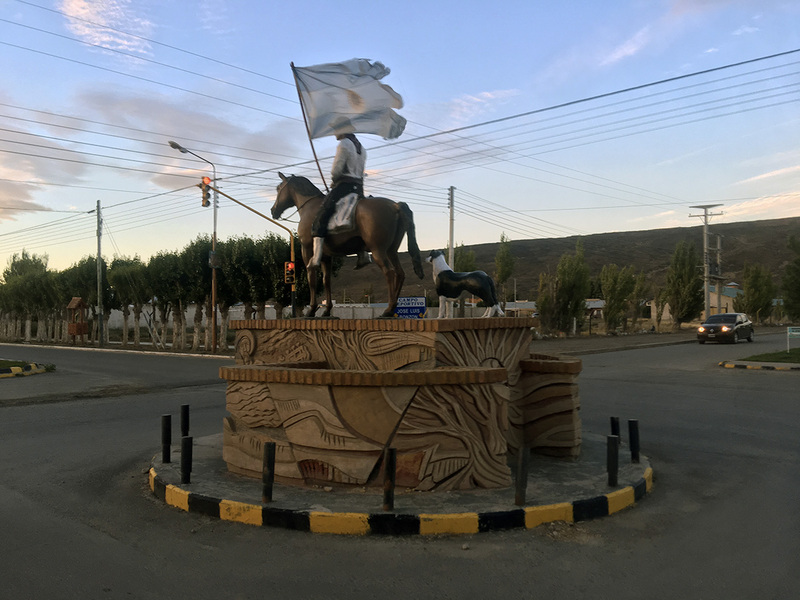 About 70 kilometres farther, I crossed, in the middle of nowhere, the small village of Tres Lagos. Lots of action in town this afternoon! 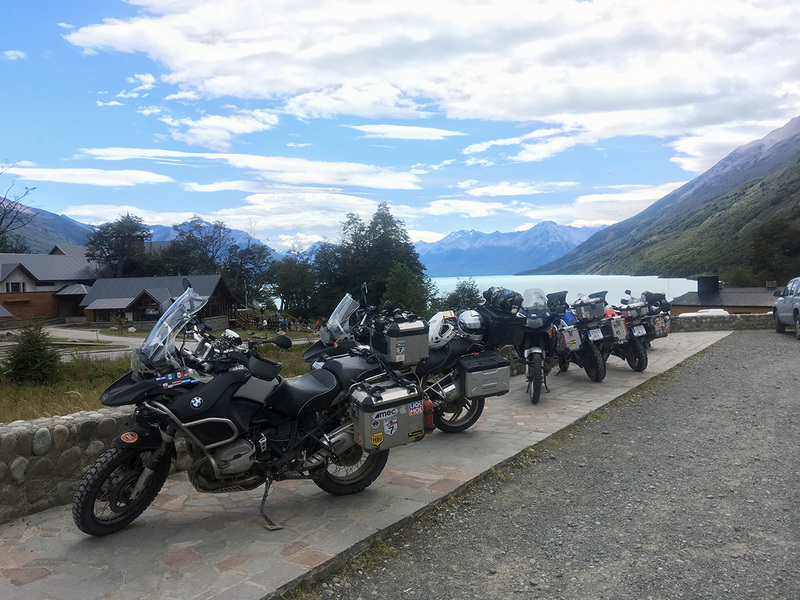 I unfortunately do not have their names, but I raise my hat to them to travel this way, with each their bikes, camping almost every evening… I could also make do it, but for several reasons, I decide mostly to get myself a room at the end of the day. 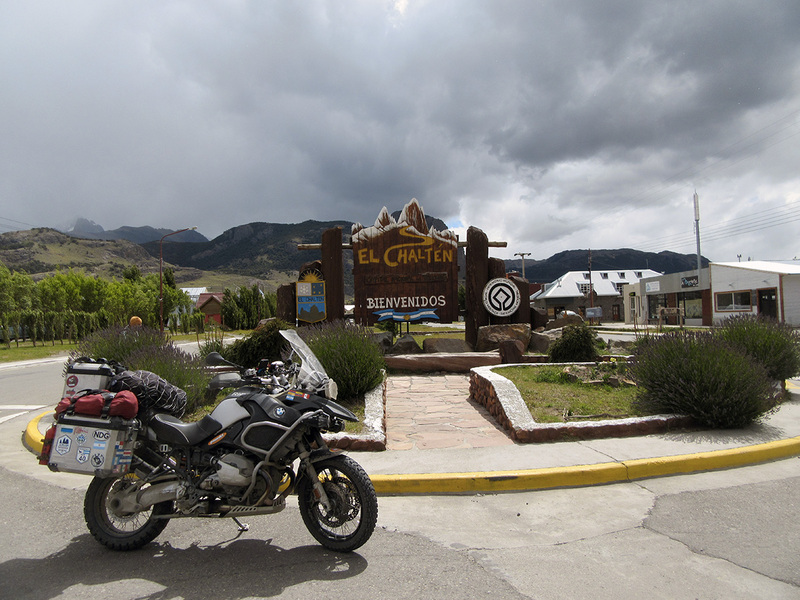 I know to what extent it is necessary to work hard to camp at the end of a long stretch of riding. Make it night after night, and especially in Patagonia, where nature has completely the control over you, a something which I admire. Bravo! 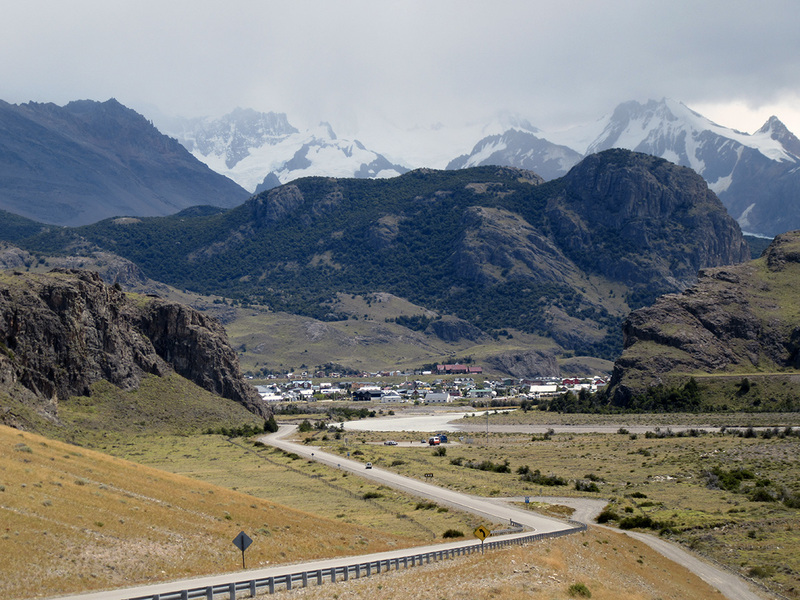 The last 150 km are done on a superb road, especially when arriving at El Chalten, where huge mountains and glaciers suddenly make their appearance. Ah yes, and so did the rain!!! Prices to eat and sleep in this city are completely mad. The day before, I had reserved an modest room in a hostal for 115$ per night. Wow! My technique here differs a bit from the rest of the trip. First of all, I do a research with hotels.com or booking.com. I also use Google Maps and the iOverlander.com app. I am hesitant to reserve online, because if something happens and I am not able to get to my destination, I still have to pay for that night. What I do here, to avoid this, is to contact the hotel directly to reserve by telephone, as almost everywhere in Latin America, they do not ask to get your credit card number to secure a room. I am therefore free to go or not. In this case, I was able, by knocking on a few doors, to find a great big room for 35 % less! As I make do, I took the time to contact the other hotel to cancel. It is a question of respect and it is, I believe, always appreciated, especially in the smaller establishments. Unfortunately, winds were very much present as well as strong rain at times. I therefore rested a bit in my great big room and prepared my things for a trek which I was planning to do the following day. I went out to try to find myself a beer in a market not very far from my hotel. The city is very dynamic, filled with tourists, but with a positive vibe. 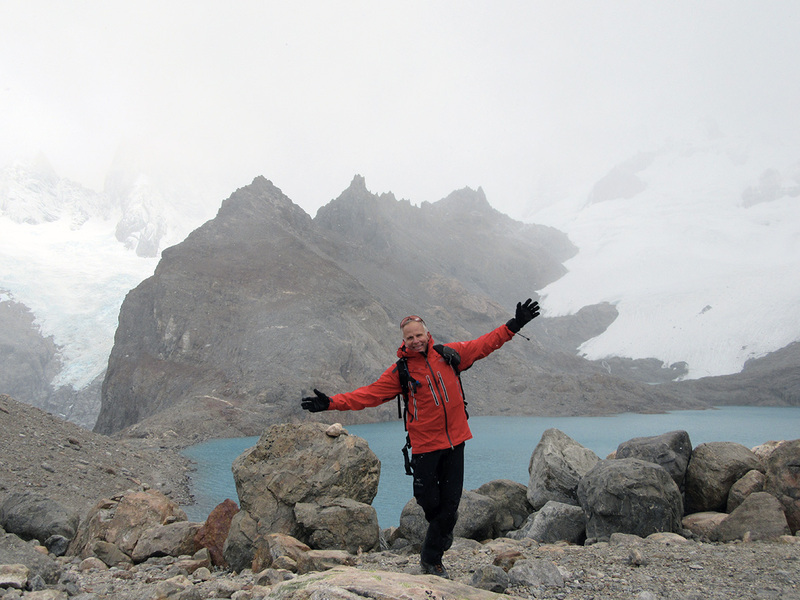 People who are here have worked (or paid) extremely hard to get there and the majority enjoy trekking and nature. The consequence, of course, is that the offer does not meet the request and restaurant prices are prohibitory. I resolved, once again, to eat empanadas at the hotel! Some might think that I am little greedy. Yes, you are right, but it is necessary to put it in perspective. I am on this trip since September. I must pay the big price for almost every minute that I sleep and every calorie that I eat. 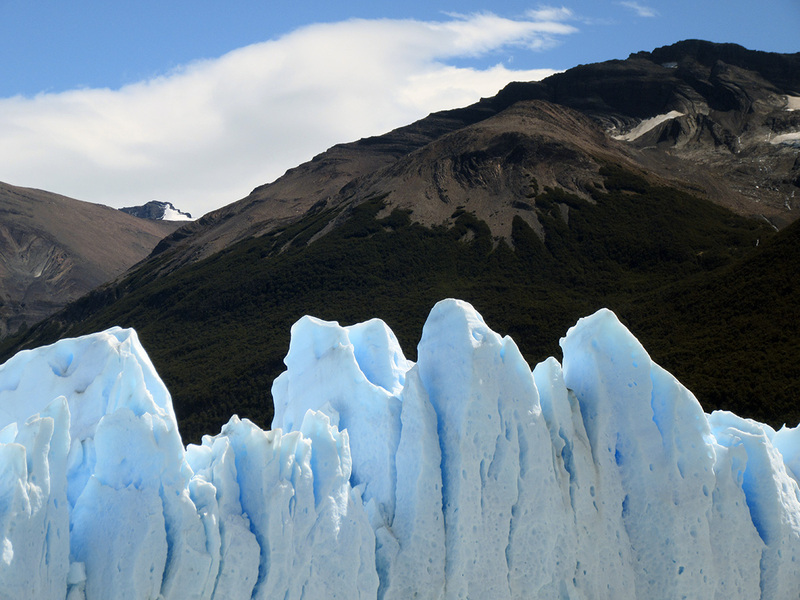 I make a serious effort to keep things to a reasonable cost, but in Patagonia, it is a difficult task. 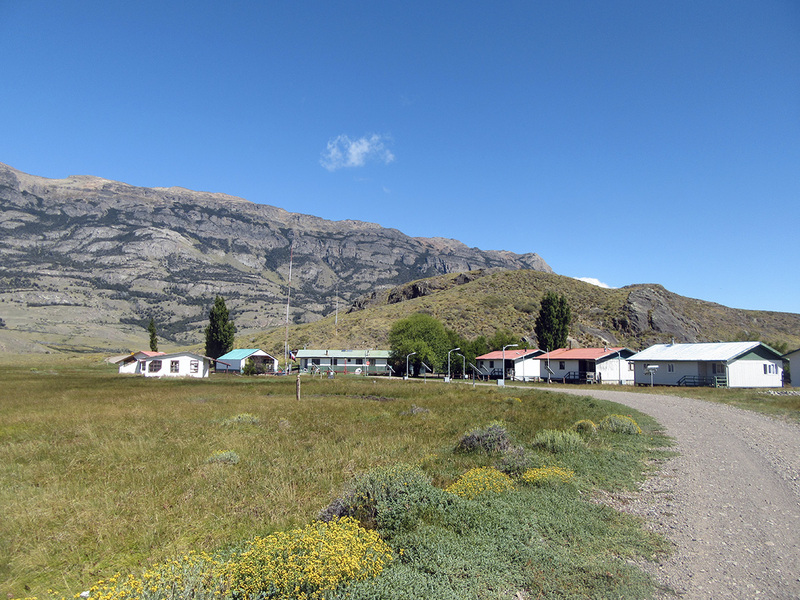 The village of El Chalten, during a few minutes per year while it is not covered with clouds and rain! 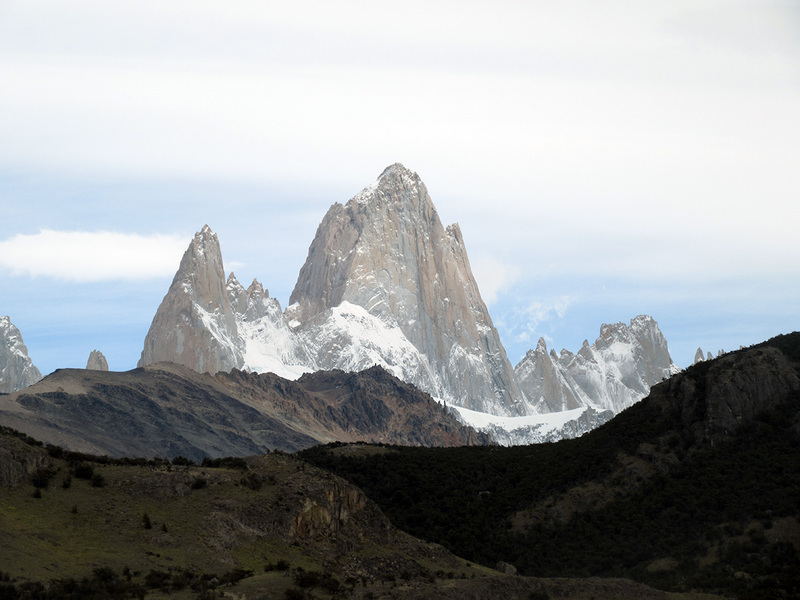 In the morning of January 30th, I had a superb trek towards the mirador of mount Fitz Roy. The trail starts in the city therefore not need to drive. What a bonus! The wind is blowing very hard and the time is variable. When clouds recede, it is necessary to make it quick taking pictures! It really changes fast. The forests are impressive. Trees do demonstrate very well the toughness of the climate as they have to fight the elements season after season to survive. In just a few minutes, clouds make their appearance! 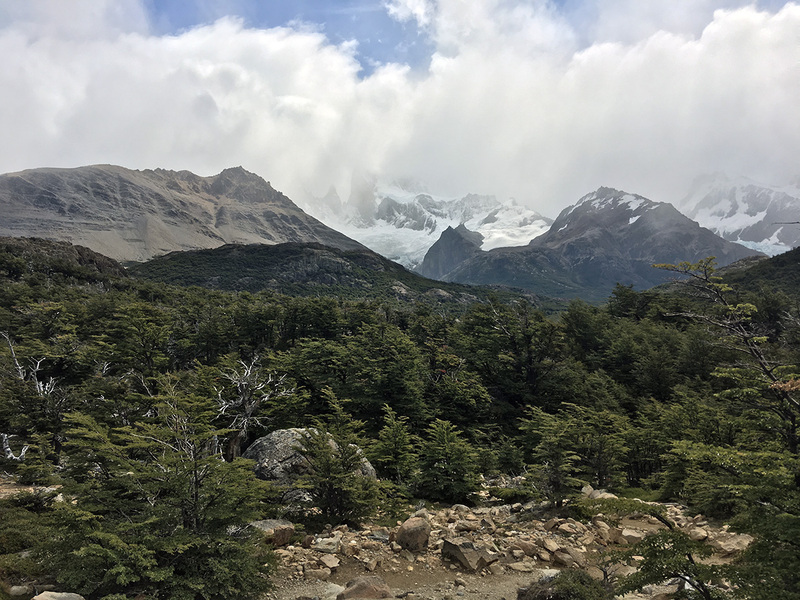 The trail was about 10 kilometres one way, and is nor difficult or technical, but nevertheless rather long it’s a good workout for the old knees! Some portions are exposed. It is therefore necessary to bring good clothes for the cold, wind and rain. Note that the last kilometre is rather abrupt, but nothing tragic. After a 3 hours walk, I arrive at the mirador. 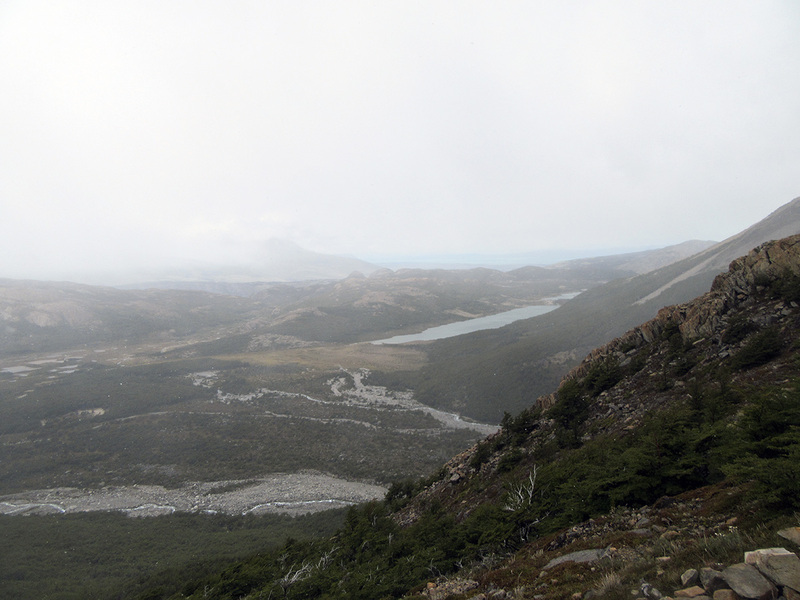 Unfortunately, the cloud cover spoils the show, but still, what happiness of the old hiker! The next morning, I finally had the chance to observe the show for which so many people come here! Impressive! 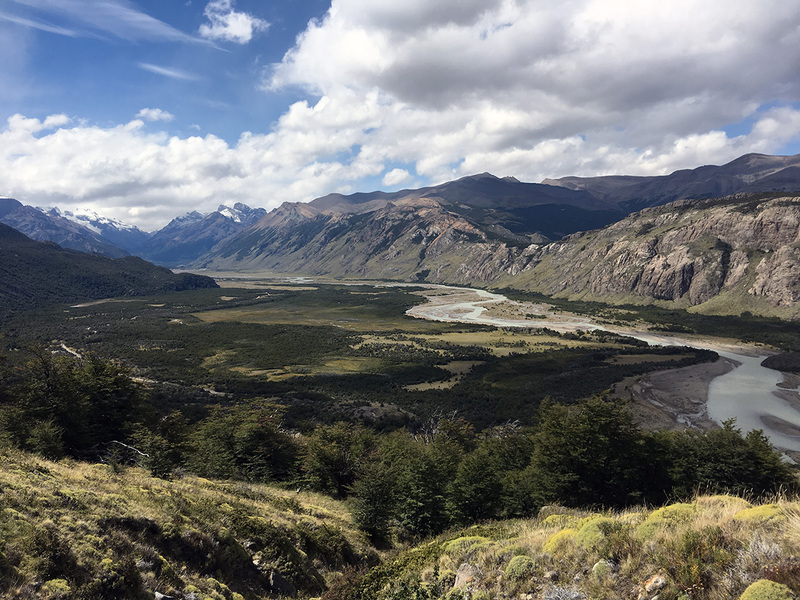 While driving the Carretera Austral, I had met a couple from Massachuset who rented a motorbike in Osorno, Chile and going almost thru the same path as I was, but ending it Puerto Natales. It is special to cross paths again in a small grocery of a town, in another country, more than 1000 km from where we met! This time, we took the time to swap our information and who knows, we might perhaps meet again before the end of their trip. Driving a GS in flip-flops??? Hem, not sure! February 1st already! 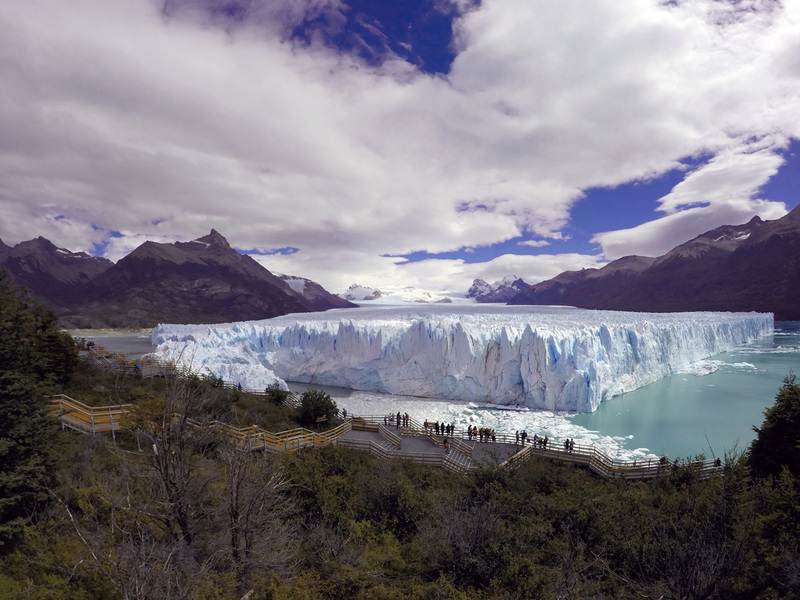 The day is dedicated sorely to drive to and visit the famous Perito Moreno glacier. 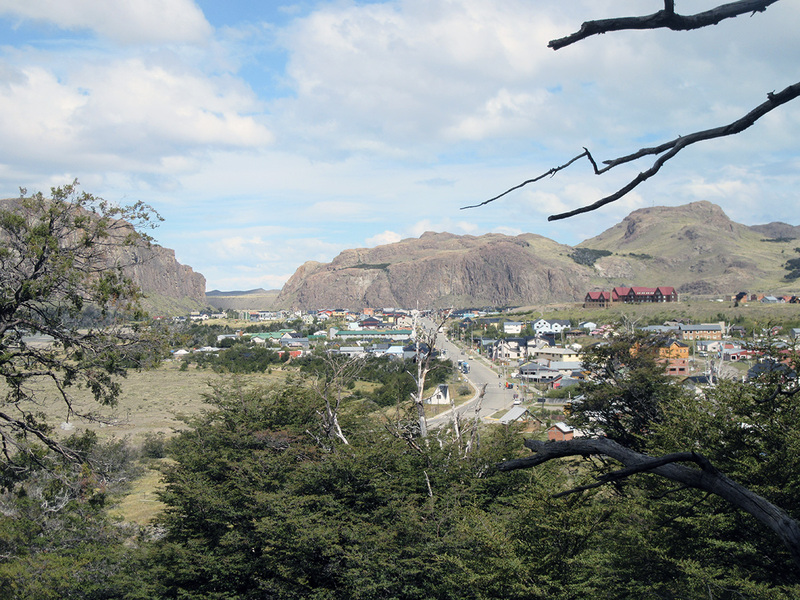 It is a very touristic place which is also a compulsory stop in Patagonia. I’m quite lucky and the day almost perfect, with no wind and a superb 21 degrees! Summer is back and the season of selfies as well… Twice in so many days! But I have a good excuse, it is rare to find a stop with a big enough rock to perfectly position the camera for a shot of La Gorda and El Canadiense! 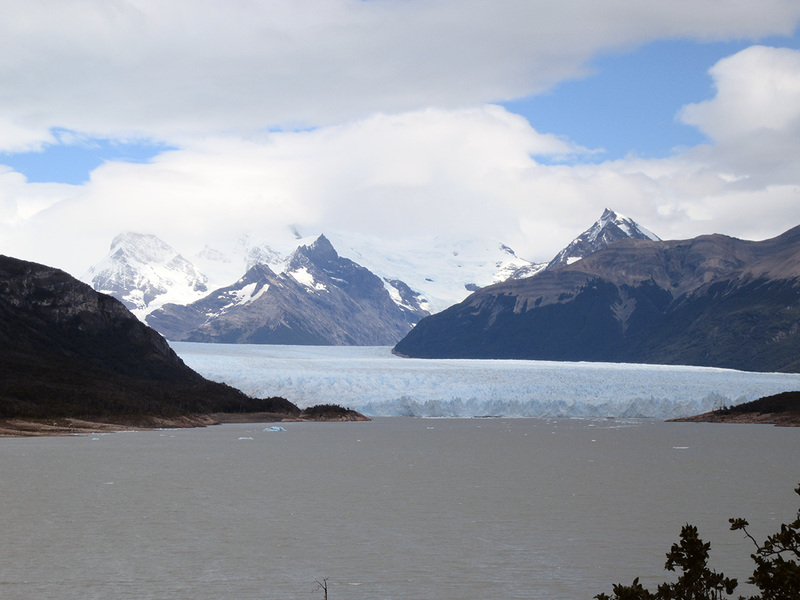 Perito Moreno is about 75 kilometres from El Calafate. 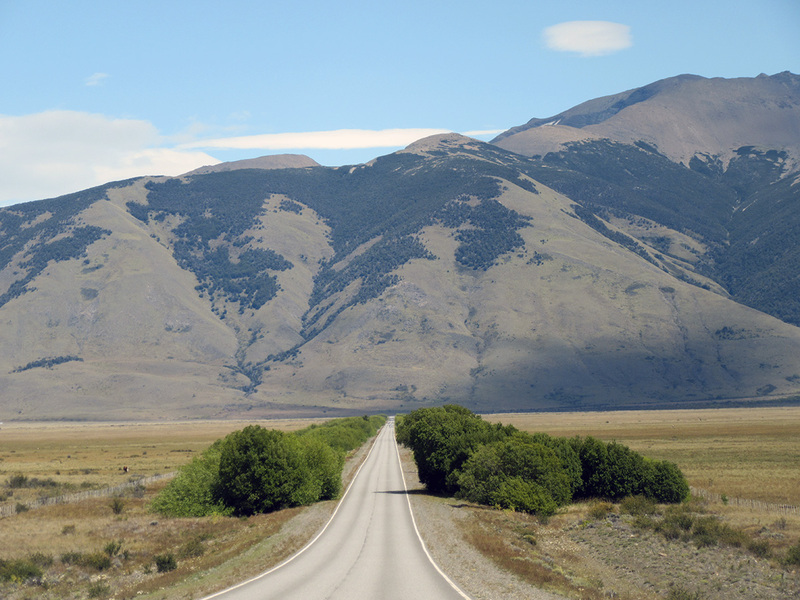 The road is superb and worth the detour by itself. 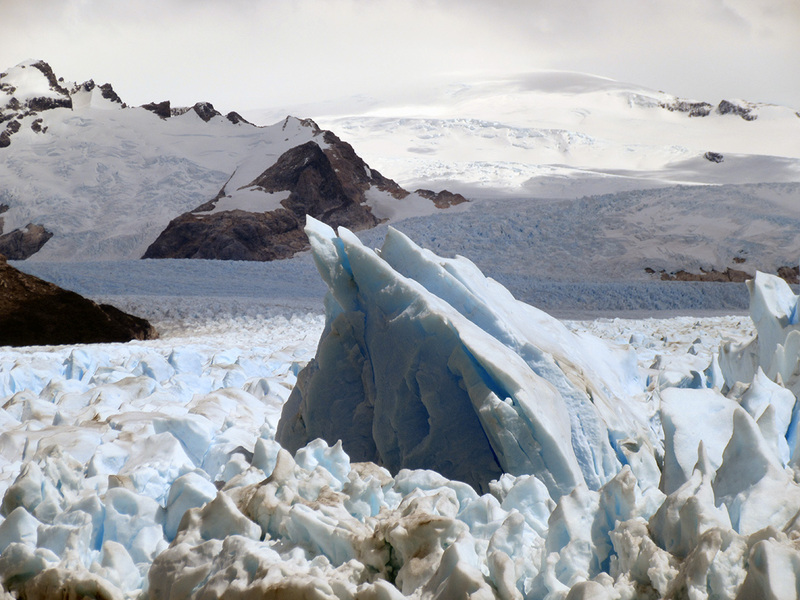 And of course, so is the glacier. It is very difficult to show the magnitude of such site in a photo, especially with a small pocket camera and an iPhone! Here is the first test. 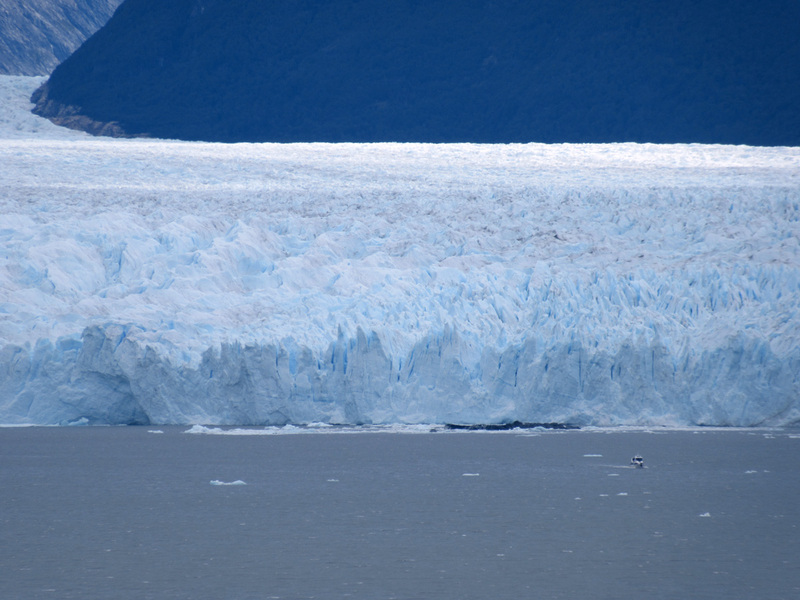 Do you see the boat navigating close to the glacier? Hint. it is right in the centre of the photo. Here it is with the help of the zoooooom from my great 100$ Canon camera! Even if it looks like a rowboat, it is a ship with a hundred passengers. 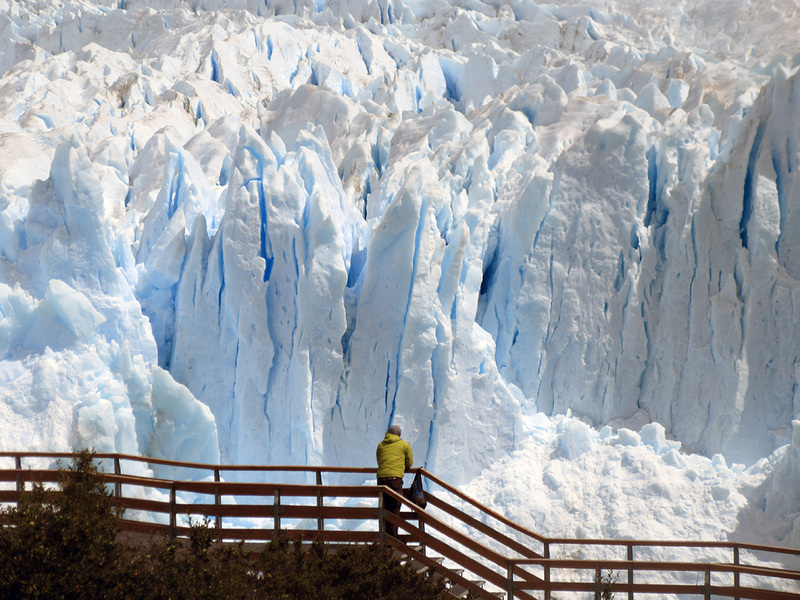 It gives a small perspective of the sheer size of the glacier, well, the visible part. Several dozen kilometres are not visible behind and many meters below water as well. I am not the only adventurer wanting to visit this wonder of nature. Another selfie??? No no! Technically it is not since another person took the picture. 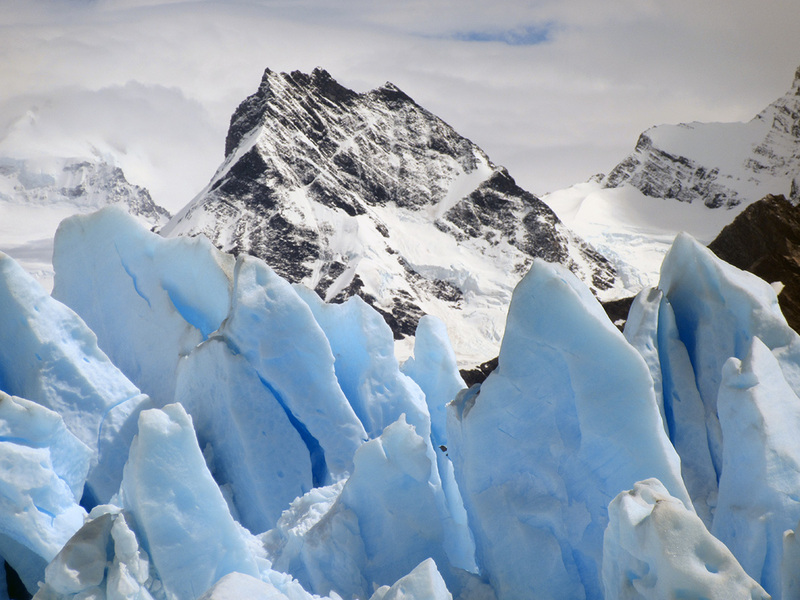 The glacier is more than 60 metres high. A footbridge is build throughout the path. 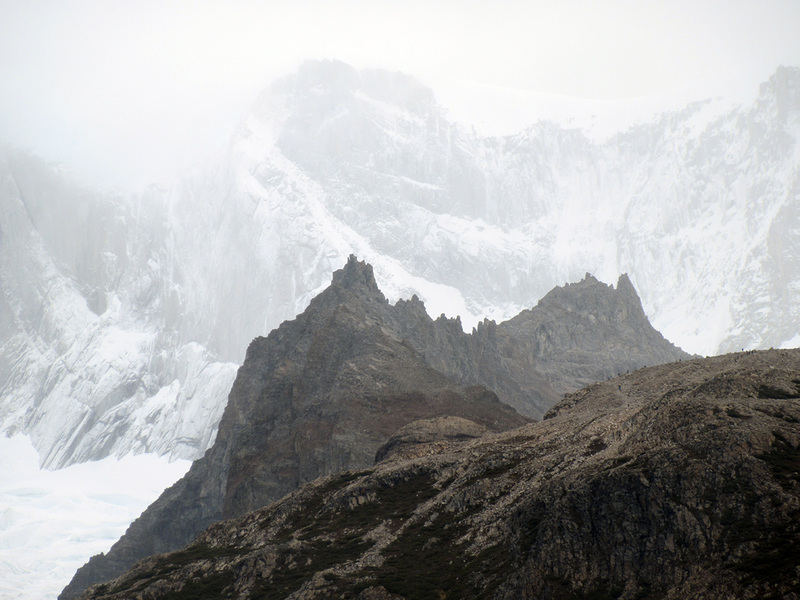 This small protuberance is… 200 metres high! When one of these mastodons breaks loose from the wall, the sound is impressive, unique and intimidating. 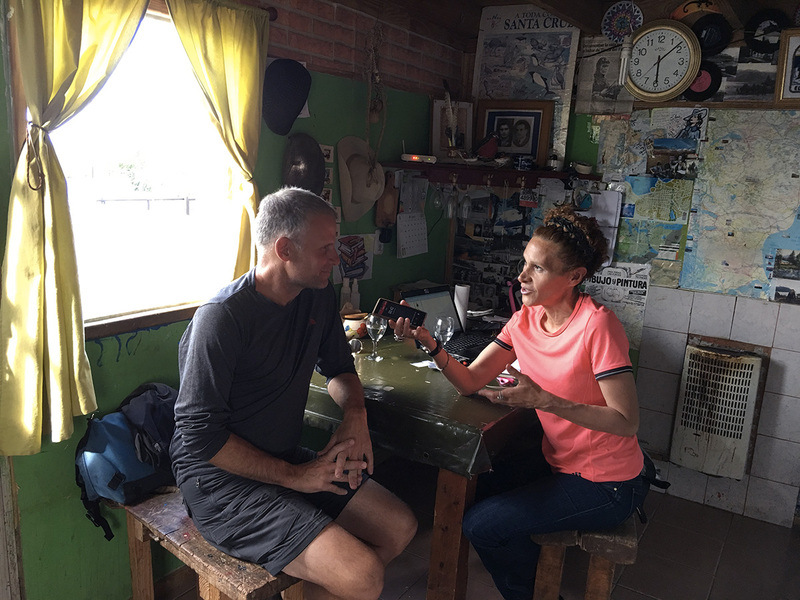 Just before dinner time, I was invited by the local radio station for an interview to describe my trip and my preparation. Cool! And all of this in Spanish. 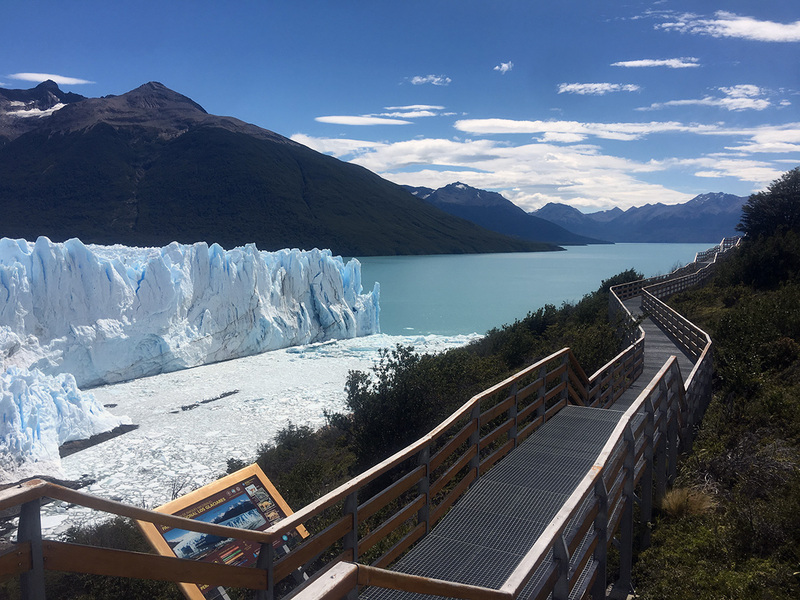 Thanks to Sivia Sotelo Echeverria from FM 100,3 El Calafate for this unique experience! I often think how I would have been able to convince my girlfriend to accompany me on such a 6-month trip… Have I found the answer! And a parking sport for La Gorda! Oh Lala! La Routa 40 was not easy, but I was in for imperishable memories and I could finally demystify a place which I wanted to know for many years! 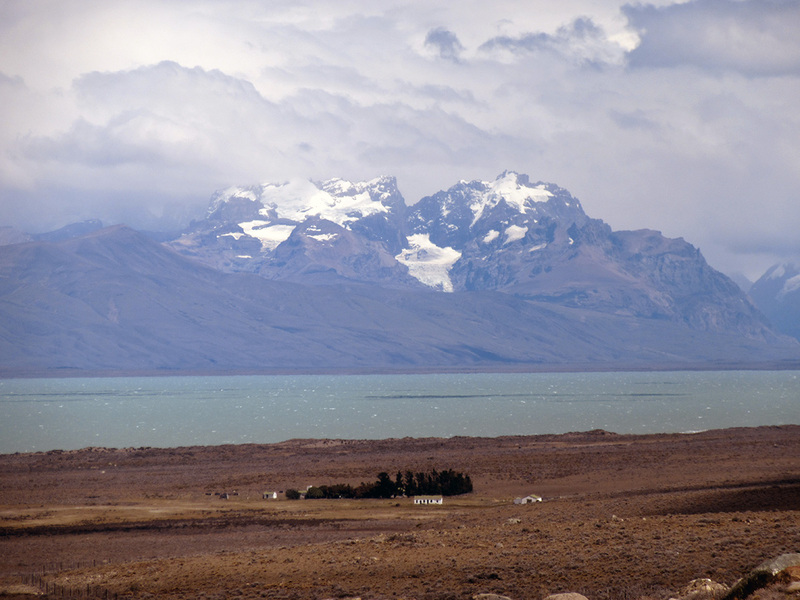 Tomorrow, I go back into Chile and I make the final approach towards what will be the final point of my trip south. 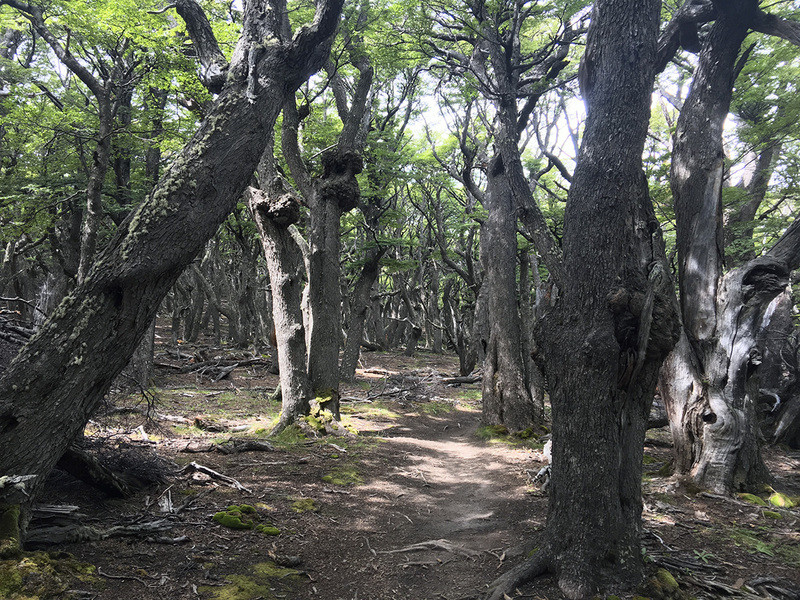 Tierra del Fuego, also known under El Fin del Mundo, The End of the World. Adventurer at heart. 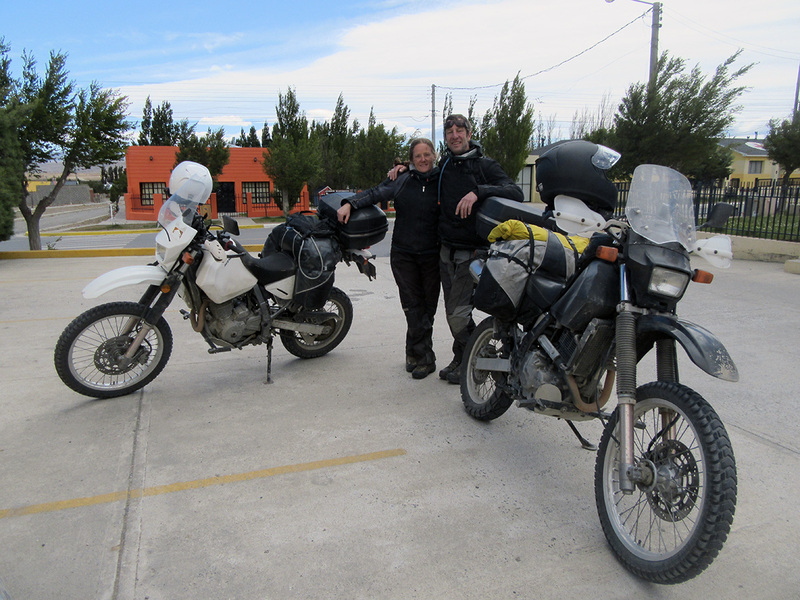 Travelling on 2 wheels to South America soon! Fantastic blog post, Mark! We went through there a few weeks ago and this helps us live it again. 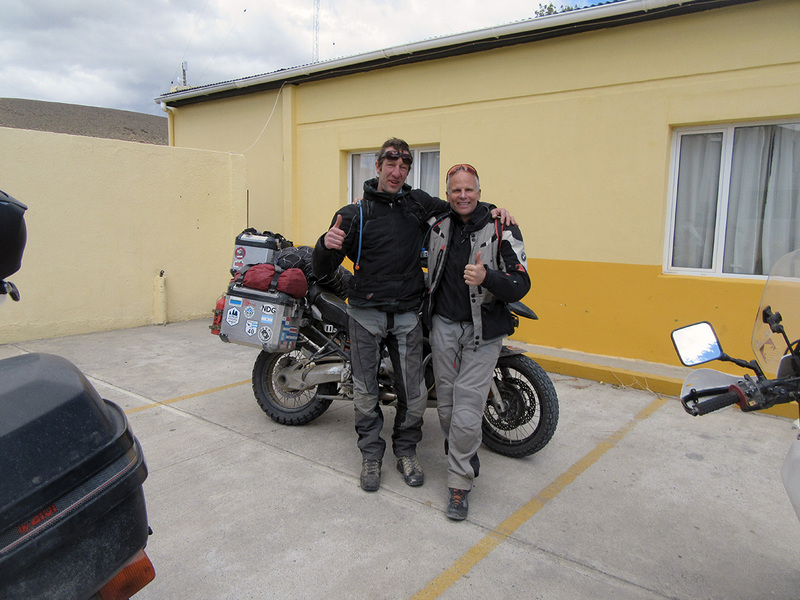 We are in Mendoza, heading to Santiago soon for Casa Matte again. 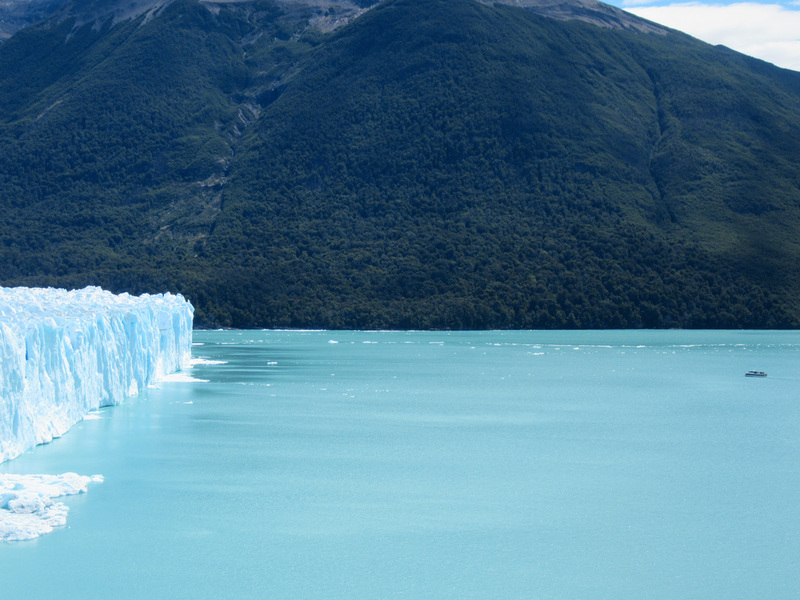 Where are you headed after Patagonia? Thank you so much! It’s great to have you on board! 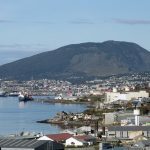 I’m spending a couple of days in Ushuaia and then straight to Buenos Aires. I’m a bit lazy… Rented an appartement for the last month of my trip! Let me know if you are there at some point. We must go for an asado! 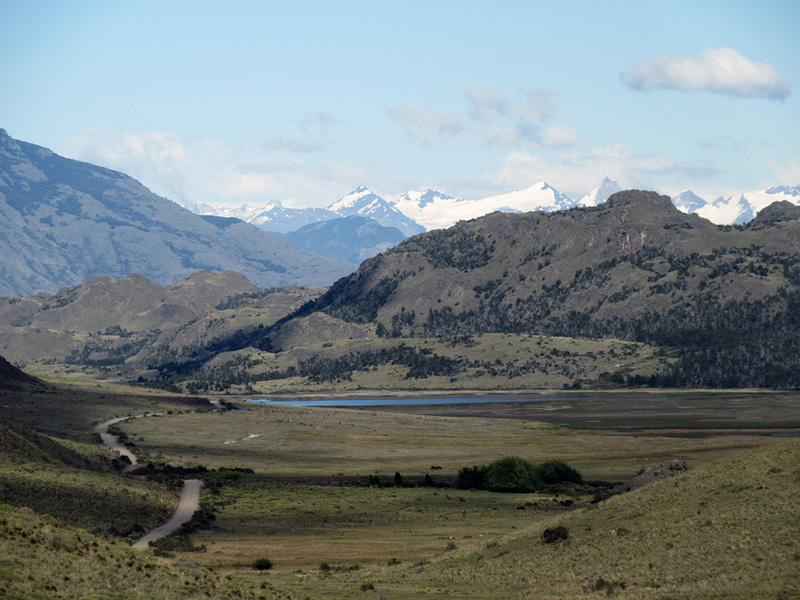 Isn’t Patagonia beautiful! 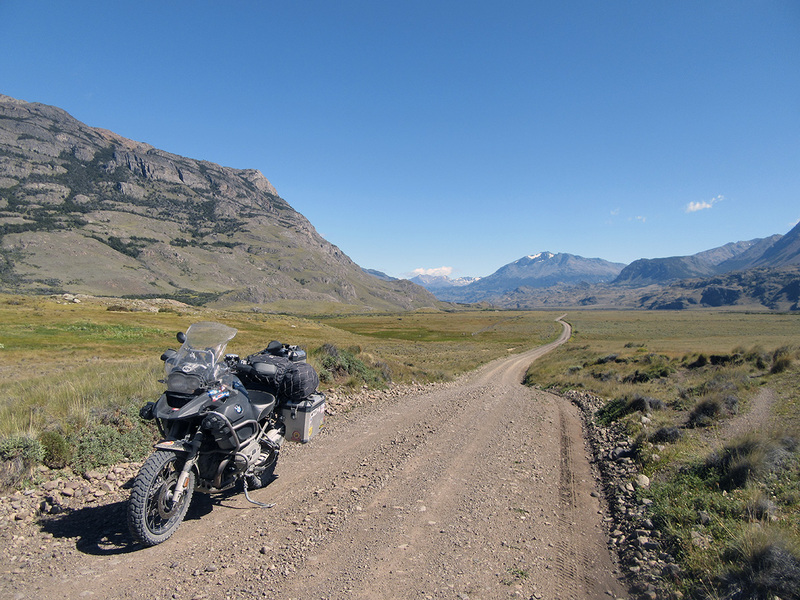 I rank it up there with the Canadian Rockies for scenery and riding, just fantastic. Both places, it’s like riding through a postcard. 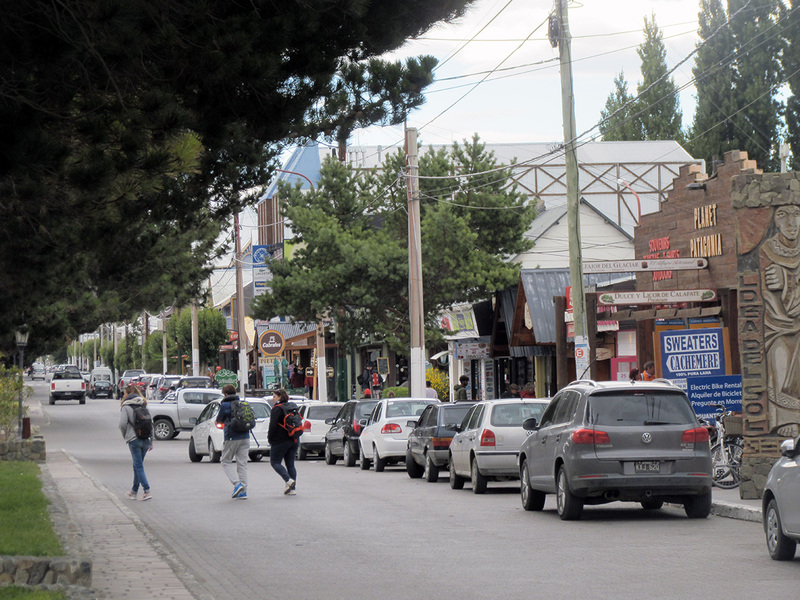 I was in Ushuaia 2013, Jan 6, it snowed, and that was summertime down there. 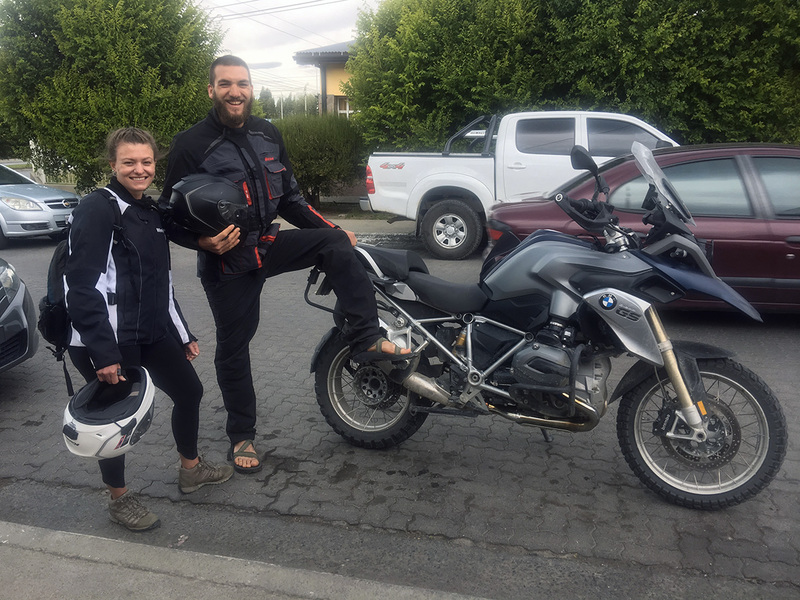 Talk about fun riding… Enjoy the rest of your adventure. 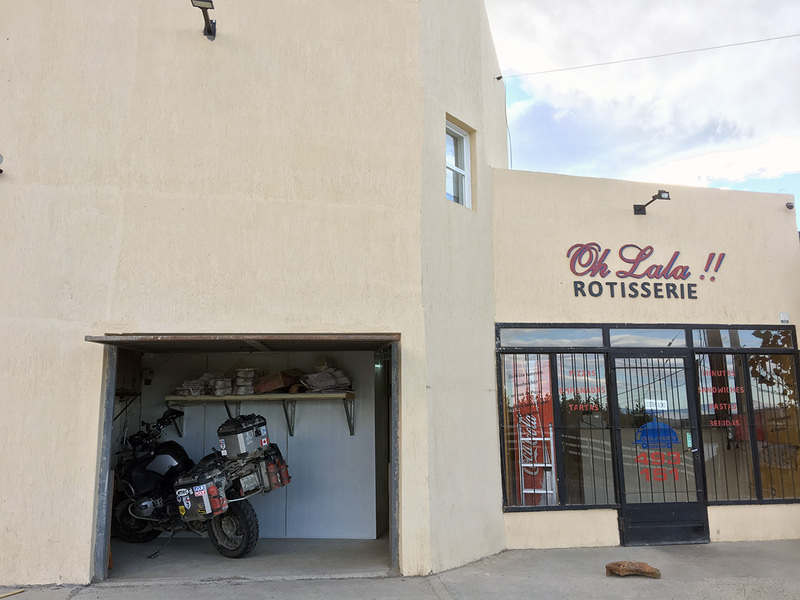 Will Dakar Motors be helping you with shipping in Buenos Aires? Yes, it’s quite incredible, although very touristic. I thought I was going to be more isolated! I can’t imagine myself ride in snow! It must have been terrible! Dakar will indeed setup the transport for me. I’ve known Javier for many years and his reputation is good so I’m hoping for a smooth ride! Super le blog Marc, les photos sont superbes et ça donne vraiment le gout de m’organiser!! J’ai les mêmes bottes Arc’teryx, est-ce que tu les mets dans toutes les conditions? Merci, je te souhaite ce voyage un jour. Merci aussi pour le clip, je vais corriger le post. Pour ce qui est des bottes, comme ce sont les seules que j’ai, oui, je les porte presque tous les jours depuis septembre! La principale raison de mon attachement profond à celles-ci est que pour la première fois de ma vie, j’ai trouvé une chaussure de randonnée avec laquelle je n’ai vraiment mais vraiment aucune douleur aux pieds, et ce, même lors de longues sorties. Elles ne sont toutefois pas parfaites. Premièrement, elles ont tendance à produire de mauvaises odeurs par temps très chaud. Ma solution est de porter in liner avec un bas en laine de merino très mince par dessus. Finalement, et beaucoup plus sérieux, la chaussette de la botte a fini par perdre ses propriétés imperméables durant le voyage. Arc’terix m’en a envoyé une nouvelle paire sous garantie mais à garder en tête.